Girls fourth and boys sixth in SLU High School Strawberry Relays. STA girls team of Jalyn James, Breanna Becerra, Madelyn Nicaud and Abby Bates opened up the meet with a first place finish in the 800 meter relay with a winning time of 1:47.17. Lucas lead the STA boys on the track with a first place finish in the 800 meters in 2:02.26. HAMMOND, LA—The St. Thomas Aquinas girls track and field team posted a fourth place team finish in Friday’s 2019 SLU High School Strawberry Relays, while the boys team posted a sixth place team finish. The Walker High School girls team captured the team title with (121), while Academy of Sacred Heart-New Orleans was second (102), Live Oak third (81), St. Thomas Aquinas fourth (74), Cabrini fifth (54), St. Scholastica Academy sixth(44), Covington seventh(31), Salmen eighth(20), Boga,usa ninth(18), Lafayette tenth(10) and Pope John Paul and Ascension Catholic tied for the eleventh position (9). The STA girls team of (Jalyn James, Breanna Becerra, Madelyn Nicaud and Abby Bates opened up the meet with a first place finish in the 800 meter relay with a winning time of (1:47.17). The foursome of (Nicaud, Becerra, Bates and Emma Littell) also captured the 1600 meter title in (4:09.56). Becerra also won the 400 meters in a new school record time of (57.92), Bates was fifth in the 200 meters (27.95), Nicaud was third in the 800 meters (2:31.96), James was third in the 100 meters (13.14) and Littell was ninth in the 1600 meters (6:11.89). Chalah Rock posted a third place finish in the 300 meter hurdles(52.59), while Jerenia Baham was fourth in the 100 meter hurdles (19.40) and seventh in the 300 meter hurdles (56.24). Ava Alston posted a third place finish in the discus (89-10), Rock was third in the long jump(15-09), while Jade Brumfield was fifth in the long jump(15-04) and James was third in the high jump(5-0) for the lady falcons in the field events. The Jesuit boys captured the team title in the boys division with (129), Bogalusa was second (107), Walker third (83.5), Live Oak fourth (82), Covington fifth(61), St. Thomas Aquinas sixth (42), Ascension Catholic seventh (33), St. Paul’s eighth (12), Lafayette ninth (10), Lakeshore tenth (9.5), Springfield eleventh (9) and French Settlement was twelfth (7). Bogalusa’s Raheem Roberts was named the Field MVP on the boys side, while Covington’s Shane Ricks was the Track MVP and Bogalusa’s Clyedterrious Thompson earned the Overall MVP award. The STA 1600 meter relay team of: John Ross Donnes, Logan Lucas, Gavin Bankston and Landen Schillage posted a second place finish in (3:48.49). The STA 400 meter relay team of: Devin Wilson, Tyler Luster, Michael Johnson and Earl Jackson posted a third place finish in (46.15). The 800 meter relay team of: Wilson, Luster, Bankston and Donnes posted a fourth place finish in (1:38.26). Lucas led the STA boys on the track with a first place finish in the 800 meters in (2:02.26), Wilson was third in the 100 (11.78) and fifth in the 200 (24.02), while Luster was fourth in the 100(11.88) and Donnes was fifth in the 400 (53.31). Saint Thomas Aquinas Ladies impress at Indoor State Championships! Freshman Breanna Becerra captured the Division II State title in the 800 meters with a winning time of 2:19.94. BATON ROUGE, LA—The Saint Thomas Aquinas girls Track and Field team posted a very close fourth place team finish in Saturday's 2019 LHSAA Track and Field Championships at the LSU Indoor Facility in Baton Rouge. The Sacred Heart-New Orleans & St. Katherine Drexel Prep girls won the Division II championship with 50 points each, while Brusley was third (41), STA fourth (40), West Feliciana fifth (28) and Episcopal sixth (26) in a field of thirty-five scoring teams. STA freshman Breanna Becerra captured the Division II State title in the 800 meters with a winning time of (2:19.94), just .87 seconds off of former Redemptorist runner Cierra Johnson's (2:19.07). Becerra's teammate Madelyn Nicaud followed closely at the third position in the 800 (2:22.58). The lady falcons 800 meter relay team of; Nicaud, Becerra, Chalah Rock and Abby Bates set a new school record in there second place finish in (1:48.04). The STA girls 3200 meter relay team of: Nicaud, Becerra, Emma Littell and Bates also set a new school record in their second place finish in (10:05.51), Sacred Heart ran (10:02.11), both teams surpassed the former State record held by the STA girls since 2004. The STA girls 1600 meter relay team of: Nicaud, Becerra, Littell and Bates posted a fifth place finish in (4:18.50). Rock also posted a third place finish in the triple jump (34-8.25) and was thirteenth in the long jump (14-5.75). Madeline Durnin was eighth in the high jump (4-6) and placed twelfth in the pole vault (6-11.75), while Ava Alston was twelfth in the shot put (30-5.75). Marley Vinet was ninth in the 60 meter hurdles (10.87). Loranger's Kiana Foster set a new Division II State meet record in her 60 meter dash victory in (7.46), which was the eighth fastest time in the nation thus far.. The STA boys 3200 meter relay team of: Logan Lucas, John Ross Donnes, Gavin Bankston and Douglas Robinson earned a second place spot on the podium in a time of (8:51.90). While the 1600 meter relay team of: Lucas, Bankston, Robinson and Landen Schillage was twelfth in (4:01.03). Lucas was also fifth in the 1600(4:42.63), while Donnes posted a fifth place finish in the 800 (2:04.54). Hammond High Magnet School freshman Beau Dominigue made it to the podium at the third position with a leap of (14-10.25). Saint Thomas Aquinas competes in LSU Last Chance Indoor Qualifier. Freshman Breanna Becerra posted the fastest indoor time of the indoor season in all classes to capture the 800 meters in time of 2:22.35. BATON ROUGE, LA—The Saint Thomas Aquinas girls and boys track teams competed in Saturday's LSU Last Chance Indoor Qualifier in Baton Rouge, which is the last meet prior to the LHSAA State indoor Championships on Saturday, February 16. Freshman Breanna Becerra posted the fastest indoor time of the indoor season in all classes to capture the 800 meters in (2:22.35), while Sophomore Madelyn Nicuad also made it to the podium in the 800 meters (2:27.84). The STA girls 800 meter relay team of; Becerra, Nicaud, Chalah Rock and Abby Bates posted a ninth place finish in (1:50.06), but were the fastest in Division II. The 1600 meter relay team of; Becerra, Nicaud, Bates and Emma Littell posted a ninth place finish in (4:17.7), the second fastest time in Division II. The 3200 meter relay team of: Bates, Littell, Brynleigh Berthelot and Madison Robertson placed thirteenth (11:15.69). Jourdan St. Romain placed 33rd in the 3200 (14:10.14), Robertson was 35th in the 3200 (14:26.66), while Marley Vinet posted a 27th place finish in the 60 meter hurdles(11.07). Chalah Rock led the STA girls in the field events by posting an eighth place finish in the triple jump (34-8.25) and was 25th in the long jump (15-0.50). Madeline Durnin posted a 26th place finish in the pole vault (7-0) and was 31st in the high jump(4-4), while Ava Alston was nineteenth in the shot put (30-10.75). The boys team of: Logan Lucas, John Ross Donnes, Gavin Bankston and Douglas Robinson posted a thirteenth place finish in the 3200 meter relay (9:00.79), the second fastest time in Division II. Lucas posted an eleventh place finish in the 1600(4:41.87), which is the fifth fastest time in Division II qualifying, while he was forty-sixth in the 3200(11:58.41). Donnes was fifteenth in the 800 meters (2:06.03), which has him at the fifth fastest time in Division II qualifying. Robinson was sixty-ninth in the 800 (2:22.22), while freshman Landen Schillage was forty-eighth in the 3200(12:07.85) and sixty-fifth in the 1600 (5:21.45). The STA girls have all three relays qualified for the state meet, athletes in the 400, 800, 60 hurdles, high jump, pole vault, long jump, triple jump and shot put. The STA boys have qualified in the 3200 and 1600 relays, 800 and 1600. Saint Thomas Aquinas competes in 2019 McNeese Indoor II High School Invitational. Chalah Rock captured a first place finish in the triple jump. LAKE CHARLES, LA—The Saint Thomas Aquinas High School Track and Field team competed in the 2019 McNeese Indoor II High School Invitational Saturday in Lake Charles. STA Junior jumper Chalah Rock captured a first place finish in the triple jump (36-5), which puts her in the top qualifying position in Division II, Rock also posted a ninth place finish in the long jump (16-4.50), which puts her tied with Westlake's Kionda Johnson for the top mark in Division II qualifying. The lady falcons 3200 meter relay team of: Emma Littell, Brynleigh Berthelot, Paige Bankston and Madison Robertson posted a fourth place finish in (11:54.58). Robertson posted a 30th place finish in the 1600 (6:27.33) and Banskston was 70th in the 400 (1;17.83), while Ellie Allain was 65th in the 55 (9.15) and Madeline Durnin was fourteenth in the high jump (4-6) and 67th in the 55(9.70). On the boys side the Falcon 3200 meter relay team of Landen Schillage, Andrew Dawson, Alec Dufriend and Ethan Foster posted a tenth place finish in (10:06.20). Schillage was also 53rd in the 1600 (5:33.51), Foster was 65th in the 1600 (5:59.74) and Dawson was 70th in the 1600 (6:48.92). The STA teams will compete this upcoming Saturday in the 2019 LSU Last Chance Qualifier prior to the LHSAA State meet to be held February 16, 20. Saint Thomas Aquinas competes in McNeese State High School Indoor meet. STA boys 3200 meter relay team of Logan Lucas, John Ross Donnes, Douglas Robinson and Gavin Bankston posted a first place finish in the time of 9:01.60, and Breanna Becerra led the Lady Falcons with a first place individual finish in the 800 meters in a time of 2:26.88. LAKE CHARLES, LA—The Saint Thomas Aquinas girls and boys Track and Field teams traveled to the McNeese State High School Indoor meet on Saturday in Lake Charles to compete. Freshman Breanna Becerra led the lady falcons with a first place individual finish in the 800 meters (2:26.88), followed closely by sophomore teammate Madelyn Nicaud at the second position in the 800 meters (2:32.32) and Emma Littell was twenty-sixth (2:49.29). Junior Chalah Rock led the Lady Falcons in the field events with a pair of third place finishes in the triple jump (34-11) and long jump (16-0). The 3200 meter relay team of; Nicaud, Becerra, Littell and Brynleigh Berthelot posted a second place finish in (10:34.61), the 1600 meter relay team of; Nicaud, Becerra, Rock and Abby Bates posted a fifth place finish in (4:27.52) and the 1600 meter relay "B" team of Littell, Madelin Durnin, Jourdan St. Romain and Madison Robertson were thirteenth (5:05.66), and the 800 meter relay team of Bates, Durnin, Paige Bankston and Ellie Allain placed fourteenth (2:05.60). Durnin was eighteenth in the high jump (4-4), Bates was sixteenth in the 400 (1:06.44) and Bankston was 45th in the 400 (1:17.56). Robertson was 24th in the 1600 (6:27.43), Berthelot was 25th in the 1600 (6:28.52) and St. Romain was 29th in the 1600 (6:34.52). The STA boys 3200 meter relay team of Logan Lucas, John Ross Donnes, Douglas Robinson and Gavin Bankston posted a first place finish in the time of 9:01.60, while the same foursome was eighth in the 1600 meter relay (3:50.90). Donnes was eighteenth in the 400(56.45), while Robinson was 42nd in the 400 (1:00.64), while Lucas posted a sixth place finish in the 800 (2:10.55), while Alec Dufriend was 48th in the 800 (2:52.84). Landen Schillage posted a 31st place finish in the 1600 (5:33,34), Ethan Foster was 43rd in the 1600 (6:13.29) and Dufriend was 45th in the 1600 (6:14.60), while Foster was fifteenth in the 3200 (13:59.43). The STA teams will compete at next Saturdays LSU High School Qualifier in Baton Rouge. Saint Thomas Aquinas competes in LSU High School Indoor Classic. Madelyn Nicaud, Breanna Becerra, Chalah Rock and Abby Bates opened up the season with a heat winning time of 1:51.46 in 800 relay. BATON ROUGE, LA—The Saint Thomas Aquinasgirls and boys track team opened up the season at the LSU High School Indoor Classic with some top Division II performances. One thousand plus athletes from Texas, Louisiana, Mississippi, Alabama, Florida and Georgia competed in events Saturday at LSU. The Lady Falcons 800 meter relay team of Madelyn Nicaud, Breanna Becerra, Chalah Rock and Abby Bates opened up the season with a heat winning time of (1:51.46), which was the Division II second best time of the meet. Thegirls 3200 meter relay team of: Nicaud, Bates, Brynleigh Berthelot and Emma Littell placed second in their heat with a time of (11:05.29), which was the fifth place overall time and a number 1 time in Division II. Littell placed thirteenth in the 1600 meters (6:12.57), while Berthelot was twenty-fourth (6:31.70). Madison Robertson was fifteenth in the 3200 meters (14:33.83), while Jourdan St. Romain ran (3:04.21) and Paige Bankston ran (3:39.58) in the 800 meters. Rock led the Lady Falcons in the field events, she posted a tenth place finish in the triple jump (33-3) and was thirty sixth in the long jump (13-8.50). Ellie Allain was fourteenth in the high jump (4-6), while Madeline Durnin was seventeenth (4-4). John Ross Donnes posted the fastest time in Division II in the 800 meters (2:08.86), which was good enough for an eleventh place finish. Logan Lucas posted the number two time in Division II in the 1600 (4:56.34), which placed fourteenth overall, while Landen Schillage was 50th in the 1600 (5:42.13). Ethan Foster was twenty-eighth in the 3200(14:26.03) and Andrew Dawson was twenty-ninth (14:30.33). Hammond High freshman Beau Domingue posted an eighth place finish in the pole vault(13-3.75), which was good enough for a number three performance in Division I. Local teams will be competing in Lake Charles next week at the McNeese State HS Meet. Saint Thomas Aquinas competes in LHSAA State Meet. Ladies post a pair of runner-up finishes in relays. John Ross Donnes led the STA boys with a second place finish in the 800 meters. BATON ROUGE, LA—The Saint Thomas Aquinas girls posted a seventh place team finish, while the boys team placed thirteenth in Friday's LHSAA Class 2A State Track and Field Championships held in Baton Rouge at LSU's Bernie Moore Stadium. “This was a rebuilding year for us and we didn’t qualify a bunch of kids like we normally do, however, we were very pleased with the athletes that competed this year at the state meet,” said Falcon head track and field coach Miguel Becerra. The St. Katherine Drexel Prep girls captured the team title with (74), Episcopal was second (63), Port Allen and Catholic New Iberia tied for third (34), Menard was fifth (48), Newman sixth (31), STA seventh (28), MLK Charter ninth (24) and Patrick Taylor was tenth (17). Sophomore Chalah Rock led the lady falcons in the field events with a third place finish in the triple jump (35-00.25), while Freshman Ava Alston posted an eighth place finish in the discus (88-7). The STA girls 400 meter relay team of Rock, Abby Bates, Brilee Broussard and Lexi Williams posted a very close second place finish with a time of (50.15), while champion Port Allen also ran 50.15, the timers had to go to the camera to break the tie, PA (50.141) and STA (50.149). The STA foursome of; Madelyn Nicaud, Bates, Williams and Broussard posted a second place finish in the 800 meter relay (1:47.35). The 1600 meter relay team of; Williams, Nicaud, Crawford and Bates posted a second place finish in (4:09.35). St. Helena Central's Shania Brumfield made it to the podium in two events, she was second in the 100 (12.45) and was third in the 200 (25.88). Springfield’s Toni Jackson posted a fourth place finish in the shot put (33-2). The Episcopal boys captured the team title with (137), East Feliciana was second (58), Catholic New Iberia was third (34), Riverside Academy fourth (32), Newman and Church Academy tied for fifth (30), Oakdale was seventh (28), Winnfield eighth (25), Mansfield ninth (22), Ascension Episcopal tenth (18), Many and Port Allen eleventh (16) and STA was thirteenth (15). Junior John Ross Donnes led the STA boys with a second place finish in the 800 meters (2:00.28), while Junior Logan Lucas was third in the 1600 (4:32.76) and was seventh in the 3200 (10:50.29) and Senior David Anthon was sixth in the 1600 (4:49.36) and was eighth in the 3200 (10:57.65). Senior Will Hetzinger placed seventh in the 110 meter hurdles (15.89), and was eighth in the 300 meter hurdles (44.28) and javelin (138-0). The 400 meter relay team of; Devon Wilson, Tyler Luster, Jude Vitrano and Adam Hetzinger placed ninth (44.79), while the1600 meter relay team of; Donnes, Vitrano, Wilson and Dawson Gildig was ninth in (3:45.12). Saint Thomas Aquinas Boys earn runner-up honors at Regionals!! Senior Will Hetzinger was named the Overall MVP in the boys division and junior Logan Lucas was a double winner. NEW ORLEANS, LA—The St. Thomas Aquinas boys track team posted a second place finish, while the girls finished a close fourth in Wednesdays 2018 LHSAA Region 3-2A Track and Field Championships held at Tad Gormley Stadium in New Orleans. The top three finishers in each event will advance to the 2018 LHSAA Class 2A State Championship next Friday at LSU’s Bernie Moore Stadium. The Newman boys captured the team tile with (139), STA and Riverside tied for the second position (97), Patrick Taylor was fourth (50.5), St. Helena Central fifth (41), South Plaquemine sixth (39), Country Day seventh (28), Springfield eighth (19), Amite ninth (15), Pope John Paul tenth (12), Pine eleventh (10), Independence twelfth (5), French Settlement and Dr. King Charter thirteenth (2) and Fisher finished fifteenth (1.5). STA’s Senior Will Hetzinger was named the Overall MVP in the boys division. Hetzinger won the 110 meter hurdles (15.81) and had a pair of second place finishes in the 300 meter hurdles (42.94) and javelin (141-6) and also placed fifth in the high jump (5-08). Logan Lucas was a double winner in the 1600 (4:40.52) and 3200 (10:48.92), while David Anthon qualified second in the 1600 (4:50.27) and 3200 (10:58.16). John Ross Donnes was the 800 meter champion (2:02.16), while Douglas Robinson placed tenth in the 800 (2:19.71). The STA boys 1600 meter relay team of Donnes, Jude Vitrano, Dawson Gildig and Ethan Alston finished first in (3:32.99), while the foursome of Devon Wilson, Alston, Adam Hetzinger and Tyler Luster qualified third in the 400 meter relay (44.09). Vitrano posted a fifth place finish in the 400 (53.29), Alston was seventh in the 100 (11.22) and placed fourteenth in the javelin (99-07), Wilson was sixth in the 200 (23.33) and eleventh in the 100 (11.48). Dustin Thomas placed fourth in the high jump (5-10), Luster was tenth in the long jump (18-11.50) and eleventh in the triple jump (38-8.75). Gabe Hester finished eighth in the discus (92-2.50) and Robert Quillen placed tenth in the shot put (33-11.25). ther local qualifiers were; Markel Cotton(Pine) in the long jump (1st-21-1.50), the St Helena Central 400 meter relay (43.90), Springfield’s Waylon Mabry in the 300 meter hurdles (3rd-44.25) and Isiah Palmer in the shot put (3rd-39-4.75). Amite’s Tyler Tucker placed second in the 800 (2:06.22). The St. Katherine Drexel Prep girls captured the team title with (98), Newman was second (91), Patrick Taylor third (83), STA fourth (77), McGehee fifth (53), Dr. King Charter sixth (36), Pope John Paul seventh (25), St. Helena Central eighth (24), Riverside Academy ninth (15), Amite and Springfield tenth (14), Fisher twelfth (10), Country Day thirteenth (7), Northlake Christian fourteenth (5), St. Mary’s Academy-New Orleans fifteenth (2) and Pine was sixteenth (1). Leading the STA girls qualifiers were all three relays. The 400 meter relay team (Abby Bates, Brilee Broussard, Lexi Williams and Chalah Rock) finished first (50.11 – a new STA school record). The 800 meter relay team (Bates, Broussard, Williams and Mandelyn Nicaud) placed second (1:48.29), while the 1600 meter relay team (Bates, Williams, Nicaud and Maggie Crawford) also placed second (4:13.42). Rock was also a second place finisher in the triple jump (34-11.25) and was fourth in the 300 meter hurdles (50.86) and fifth in the long jump (16-4.75). Crawford qualified second in the 800 (2:28.32), while Nicaud finished a close fourth (2:31.06). Williams was fifth in the 200 (26.81), Broussard placed sixth in the 100 (12.85) and was ninth in the 200 (27.84) and Bates was fifth in the 400 (1:03.34). Emma Littell placed fifth in the 1600 (5:58.44), Nicole Francois was seventh in the 3200 (13:41.22) and finished eighth in the 1600 (6:08.08), while Brynleigh Berthelot placed fifth in the 3200 (13:25.99). Caroline Eschete finished ninth in the 400 (1:09.25) and high jump (4-0) and also posted an eleventh place finish in the long jump (12-06.50). Jerenia Baham finished ninth in the 100 meter hurdles (19.06). Freshman Ava Alston punched her ticket to the state meet in a third place finish in the discus (93-11), was seventh in the javelin (87-02) and eighth in the shot put (27-0). Madelyn Durnin posted a fourth place finish in the high jump (4-06), D’Asia Moore was fourth in the discus (92-05) and was sixth in the shot put (29-3.50), while Madison Plaisance placed eighth in the javelin (86-10). Other local qualifiers were; St. Helena’s Shania Brumfield in the 100 (1st-12.27) and 200 (2nd- 25.59), Springfield’s Toni Jackson in the shot put (2nd- 31-9.25) and Amite’s Whitney Franklin in the shot put (31-1.75) and Brokela Coleman in the long jump (3rd-16-7.75). Saint Thomas Aquinas Track & Field sweeps girls and boys District Titles! Sophomore Chalah Rock earned the Overall MVP with three individual first place finishes, and Will Hetzinger was named the Overall MVP with three first place finishes. COVINGTON, LA—The Saint Thomas Aquinas Lady Falcons dominated the 10-2A District Track and Field Championships held at the Christ Episcopal Track and Field Complex in Covington on Wednesday. The top four finishers qualified for the Region 3 meet to be held in New Orleans next Wednesday at Tad Gormley Stadium. The STA girls scored (133), Springfield was second with (47), St. Helena College and Career was third (40), French Settlement was fourth (14) and Doyle fifth (0). STA sophomore Chalah Rock earned the Overall MVP with three individual first place finishes in the triple jump (34-11.50), long jump (16-05) and 300 meter hurdles (51.66). Rock also joined Abby Bates, Brilee Broussard and Lexi Williams on the winning 400 meter relay (51.66). STA freshman Ava Alston earned the field MVP award with a pair of second place finishes in the discus (89-02) and javelin (81-02) and also posted a third place finish in the shot put (25-03.50). St. Helena Central’s Shania Brumfield was named the track MVP three individual wins in the 100 (12.46), 100 meter hurdles (18.58) and 200 meters (26.23) and was also on the second place 400 meter relay (54.37). The Lady Falcons also got wins from Madelyn Durnin in the high jump (4-04) and was second in the triple jump (26-05), D’Asia Moore in the discus (99-06) and she was second in the shot put (29-09.50), Abby Bates in the 400 (1:03.45), Emma Littell in the 1600 (6:11.09), Brynleigh Berthelot in the 3200 (13:50.30), Madelyn Nicaud in the 800 (2:34.08), the 800 meter relay (1:50.78) team of Williams, Bates, Broussard and Nicaud and the 1600 meter relay (4:12.74) team of Bates, Nicaud, Williams and Crawford. Maggie Crawford also qualified second in the 800 (2:39.37), while Lexi Williams qualified second in the 200 (27.18). Caroline Eschete had three second place finishes in the long jump (13-04.75), high jump (3-10) and 400 (1:10.71). Nicole Francois had a pair of second place finishes in the 1600 (6:16.06) and 3200 (13:50.47), Brilee Broussard was second in the 100 (13.15) and third in the 200 (27.25), while Jerenia Baham was second in the 100 meter hurdles (19.40) and Madison Plaisance was third in the javelin (79-10) for the Lady Falcons championship team. Springfield got wins from Toni Jackson in the shot put (33-09) and Madison Watson in the javelin (91-09). The St. Thomas Aquinas boys out-dueled the St. Helena College and Career boys (110-98) to win the 10-2A District Championship, Springfield was third (31), French Settlement fourth (23) and Doyle was fifth (0). STA’s Will Hetzinger was named the Overall MVP with three first place finishes in the javelin (150-03), 110 meter hurdles (16.07), 300 meter hurdles (44.73) and was second in the high jump (5-06). St. Helena Central’s Jeremy Griffin was named the Track MVP with a win in the 100 (11.22) a second place finish in the 200 (23.79) and was a member of the winning St. Helena 400 meter relay (44.73) and 800 meter relay (1:33.83). St. Helena’s Myron Smith earned the Field MVP award with a win in the long jump (20-02.75), a second place finish in the triple jump (40-05) and a fourth place finish in the high jump (5-06). Also getting wins for the STA boys were; Logan Lucas in the 1600 (4:46.13) and was second in the 3200 (11:14.71), David Anthon in the 3200 (11:14.67) and was second in the 1600 (4:58.98), John Ross Donnes in the 800 (2:08.76), Jude Vitrano in the 400 (52.60), Justin Thomas in the high jump (5-08) and was fourth in the triple jump (38-09.50), Devon Wilson was the 200 meter champion (23.55) and placed third in the 100 (11.66) and the winning STA 1600 meter relay (3:44.90) team of Gildig, Vitrano, Donnes and Robinson. Dawson Gildig was also second in the 400 (55.61), Ethan Alston had a pair of second place finishes in the javelin (147-0) and 100 (11.58), while the STA 800 meter relay (1:37.79) team of; Wilson, Luster, Alston and Vitrano and the 400 meter relay (45.13) team of; Adam Hetzinger, Alston, Luster and Wilson placed second. Gabe Hester was third in the discus (94-09), while Tyler Luster qualified third in the triple jump (39-07) and was fourth in the long jump (18-09.25), Douglas Robinson was fourth in the 800 (2:17.10) and Robert Quillen qualified fourth in the shot put (35-09) for the falcons district championship team. St. Helena got wins from; Cedrick Kent in the shot put (41-09), Troy Hurst in the triple jump (40-08.25) and Devon Pea in the discus (108-04), while Springfield’s Russell Egnew was the pole vault champion (9-06). Saint Thomas Aquinas competes in SLU Relays. HAMMOND, LA—The Lafayette High girls captured the 2018 SLU High School Strawberry Relays team title on Thursday with (109), St. Katherine Drexel Prep was second(87), Walker was third (86.50), Lafayette Christian fourth(64.50), Mandeville fifth (47), St. Thomas Aquinas sixth (30), St. Scholastica Academy seventh (29), Christ Episcopal eighth(27), Lakeshore ninth(50), Live Oak tenth(19), DelaSalle eleventh (9), Covington High twelfth(8.50), St. Charles Catholic thirteenth (8), Springfield fourteenth(7) and Pope John Paul and Ascension Episcopal tied for fifteenth (3). Chalah Rock led the STA girls with a third place finish in the long jump (16-2.50), a fifth place finish in the triple jump (33-5) and an eighth place finish in the 300 meter hurdles (55.02). D'Asia Moore posted a third place finish in the discus (92-2) and was ninth in the shot put (29-00.50). Ava Alston was fifth in the discus (80-5) and placed eighth in the shot put (29-4) and javelin (86-5). Brilee Broussard was fifth in the 100 (13.33) and finished eighth in the 200 (28.20). Maggie Crawford was fifth in the 800 (2:33.77), while Madelyn Nicaud was seventh in the 800 (2:37.21). Lexi Williams was sixth in the 200 (27.71), Abby Bates placed sixth in the 40 0(1:06.32) and Caroline Eschete was eighth in the 400 (1:08.62). Emma Littell finished seventh in the 1600 (6:03.13), Brynleigh Berthelot was ninth in the 1600 (6:11.86) and Nicole Francois was tenth in the 1600 (6:12.46). The STA 400 meter relay team of: Bates, Broussard, Williams and Rock placed third (51.88), while the team of; Bates, Williams, Nicaud and Broussard was fourth in the 800 meter relay (1:50.37). The Bogalusa boys won the team title with (75), Walker was second (66.25), Lakeshore third (65.25), Lafayette Christian fourth (63), Varnado fifth (45), Covington High sixth (41.25), DelaSalle seventh (39), Live Oak eighth (37.25), St. Charles Catholic ninth (37), STA and Mandeville tenth (20), Lafayette High twelfth (14), Springfield thirteenth (13), Pine Fourteenth (10), Ascension Episcopal fifteenth (8), Pope John Paul sixteenth (3) and Christ Episcopal was seventeenth (1). STA’s John Ross Donnes led the boys team with a first place finish in the 800 (2:05.68), while Douglas Robinson was tenth in the 800 (2:20.45). Logan Lucas was third in the 1600 (4:41.24), Will Hetzinger was fourth in the javelin (139-8) and Adam Hetzinger was seventh in the javelin (127-2). Tyler Luster was seventh in the long jump(19-8). Saint Thomas Aquinas Ladies earn third place finish in PHS Meet. BATON ROUGE, LA—The St. Thomas Aquinas girls and boys track teams competed in Friday’s Ponchatoula High School Track and Field Invitational. The Walker girls captured the team title with (134), Ponchatoula was second (114), STA third (92), Mandeville fourth (90), Fontainebleau fifth (67), Hammond Magnet High and Covington sixth (16), Hannan eighth (9), Loranger ninth (7), Christ Episcopal tenth (6), Albany eleventh (4) and St. Martin’s (MS) was twelfth (3). Falcon sophomore Chalah Rock led the lady falcons in the field events with a pair of wins in the long jump (16-0) and triple jump (34-8) and also posted a third place finish in the 300 meter hurdles (52.79). Junior D’Asia Moore posted a first place finish in the discus (93-7) and was fifth in the shot put (28-3). Madison Plaissance posted a fourth place finish in the discus (84-2) and was eighth in the javelin (72-4), while Ava Alston was eighth in the javelin (72-4). The STA girls 1600 meter relay team of; Madelyn Nicaud, Maggie Crawford, Abby Bates and Lexi Williams won the event with a time of (4:17.66). The 800 meter relay team of Brillee Broussard, Rock, Bates and Williams posted a third place finish in (1:50.07), while the 400 meter relay team of Broussard, Rock, Bates and Williams also placed third in (51.87). Broussard also placed fourth in the 100(13.08) and was fifth in the 200 (27.63). Crawford was second in the 800 (2:36.61) and Williams was fourth in the 200(27.61). Freshman Caroline Eschete was second in the 400 (1:07.04), Emma Littell was fifth in the 1600(5:57.31), Brynleigh Berthelot placed seventh in the 1600 (6:00.99), Hallie Buffard was tenth in the 300 meter hurdles(59.49) and Jessica Baham placed eleventh in the 100 meter hurdles (20.24). The Ponchatoula boys won the team title with (120), St. Paul’s was second (88), Fontainebleau third (72), Mandeville fourth (68), Walker fifth (52.5), St. Martin’s (MS) sixth (43.5), Covington seventh (43), STA eighth (36), Hannan ninth (18), Loranger tenth (10), Hammond Magnet eleventh (6) and Albany was twelfth (1). STA jumper Justin Thomas led the team on the field, he was third in the high jump (5-10) and placed eighth in the triple jump (38-1). Will Hetzinger was fifth in the javelin (139-8), while Adam Hetzinger was eighth in the javelin (130-07). Other field event competitors were; Gabe Hester (Discus-12th 88-11), Kylen Smith (Discus-13th-88-6), T.J. Jackson (Shot Put-15th-34-9) and Rob Quillen (Shot Put-15th-34-6). Senior Jude Vitrano won the 400 meters (51.95) and was ninth in the 200 (24.29), Logan Lucas was third in the 1600 (4:35.20) and was fourth in the 3200 (10:24.58), while David Anthon placed fifth in the 1600 (4:42.97) and 3200 (10:39.83). John Ross Donnes was fourth in the 800 (2:03.59) and Douglas Robinson was twelfth in the 800 (2:15.20). Devon Williams placed eighth in the 200 (24.21) and was fifteenth in the 100 (12.09). The STA track teams will be competing in the Covington High School Allie Smith Invitational during the Easter Break on Thursday. Saint Thomas Aquinas Ladies earn LHSAA State Runner-Up honors at Indoor State Championships. BATON ROUGE, LA—The Saint Thomas Aquinas girls track team went into Saturday’s LHSAA Indoor Division II State Championships hoping to finish anywhere between third and fifth place according to the stats on paper prior to the meet. However, really odd things happen at the state meet! The favorite going into the State meet was Saint Katherine Drexel Prep of New Orleans. In the opening event the 800 meter relay, the Saint Katherine girls anchor leg pulled-up with a hamstring injury with one hundred meters to go. This mishap propelled the Lady Falcons to a third place podium finish in the 800 meter relay. The foursome of Brillee Broussard, Madilyn Nicaud, Chalah Rock and Abby Bates turned in a season best time of (1:52.87) to earn the bronze medal. Shortly after the relay mishap, there was another odd collision in the 800 meters, where several of the top runners tripped each other up and it caused several runners to go down in the race. Senior lady falcon Yvette Miller was running in the sixth position, about ten meters behind the lead pack, well, Miller hurled herself into the third position and capitalized on the other runners mishaps and posted a season best time of (2:30.47), which put her on the podium to earn the third place medal. Thirty minutes later, the 3200 meter relay team of; Bates, Nicaud, Maggie Crawford and Nicole Francois posted a season best time of (10:32.63) to earn a spot on the podium in third place. Sophomore Chalah Rock picked up ten points in the field events for the lady falcons, she opened-up the day with a disappointing fourth place finish in the long jump with a jump of (15-11), which was only a quarter of an inch from making it to the podium. However, Rock came back to finish third in the triple jump with a jump of (34-4). “We were excited that she picked up ten points in the field for us, she is harder on herself than we are on her,” explained Falcon head coach Miguel Becerra. D’Asia Moore placed twelfth in the shot put (24-5.25). Senior Nicole Francois posted a sixth place finish in the 3200 meters (13:06.73), while Brynleigh Berthelot was twelfth in the 1600 (6:17.99). The excitement didn't stop here, going into the final event of the evening, the lady falcons were sitting in fourth place, with Brusley ahead by three points and St. James ahead by one point. The Brusley fans cheered their girls onto a first place finish in the slower heat of the 1600 meter relay, which matched the time that the lady falcons came into the meet with. The STA girls were seeded third going into the race, but came on strong at the end to finish second in the relay with a time of (4:18.64), which bettered their seed time by almost ten seconds. The podium finishing team of; Nicaud, Bates, Crawford and Miller sealed the runner-up trophy for the Lady Falcons at the end of the night. “This was an awesome team effort by the STA girls, we are very proud of them stepping up at the State meet,” added Becerra. Team scores in the girls division were; 1- Sacred Heart-New Orleans(3A) 53 2- Saint Thomas Aquinas(2A) 37 3- Brusley(3A) 34 4- St. James(3A) 31 5- St. Katherine Drexel Prep(2A) 28 6- Lusher Charter(3A) 27 7- West Feliciana(3A) 25 8- Menard(2A) 24 9- Episcopal(2A) 21 and Lafayette Christian(1A) 14 in a field of thirty-one teams that scored. Loranger's Kiana Foster was the Div. 2 champion in the 60 meter dash (7.73). In the boys division, Episcopal captured the team championship with (86), Berwick was second (50), West Felciana third (42), Baker fourth (30), East Feliciana fifth (26), Lusher Charter sixth (22), Cedar Creek seventh(20), Church Academy eighth(18), Erath and St. Martin's tied for ninth(16), Westlake eleventh (11) and Donaldsonville, STA and Ascension Episcopal all tied for the twelfth position (10) in the field of twenty-six teams that scored. The STA boys 3200 meter relay team posted a time of (8:34.97), which took the Episcopal boys to the wire with a time of (9:34.02). The STA boys relay team of; Jude Vitrano, John Ross Donnes, Logan Lucas and David Anthon earned the silver. Lucas also posted a fifth place finish in the 1600 (4:42.40), while Douglas Robinson was ninth in the 1600 (5:21.20). Freshman Tyler Luster posted a sixteenth place finish in the long jump (18-00.50). Rock and Lucas pace Falcons. BATON ROUGE, LA—The Saint Thomas Aquinas Track and Field teams competed in Saturday’s LSU Last Chance Indoor Qualifier in Baton Rouge. Sophomore Chalah Rock led the Lady Falcons with a seventh place finish in the triple jump (34-9.50) and an eighth place finish in the long jump (16-0), De’Asia Moore posted a 32nd place finish in the shot put (27-1). Nicole Francois was thirteenth in the 3200 (12:58.38), while Abby Bates was eighteenth in the 1600 meters (6:08.51) and Brynleigh Berthelot was 32nd in the 1600 (6:21.76). Yvette Miller posted a fifteenth place finish in the 800 meters(2:37.49), while Maggie Crawford was 27th in the 800 (2:43.26). The 1600 meter relay team of; Bates, Crawford, Miller and Rock posted a tenth place finish in (4:25.10), which earned them a spot in the fast heat of the LHSAA State Championships on February 17th at LSU. The foursome of Bates, Rock, Brilee Broussard and Lily Maggio posted a 23rd place finish in the 800 meter relay (1:56.83). Broussard and Lily Maggio posted a 23rd place finish in the 800 meter relay (1:56.83). 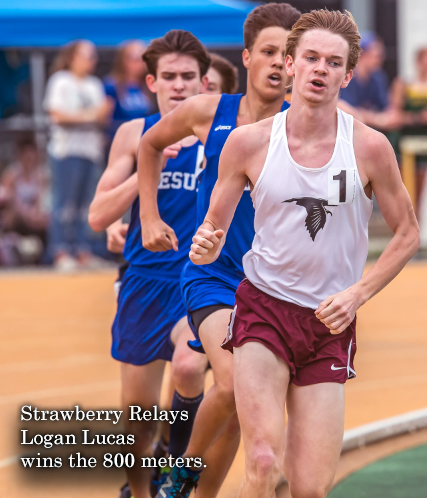 Distance runner Logan Lucas posted the top spot for the Falcons, as he was fifteenth in the 1600 meters (4:48.73) and David Anthon was eighteenth in the 1600 (4:50.94). John Ross Donnes was eighteenth in the 800 meters (2:08.56), while Jude Vitrano finished 63rd in the 800(2:25.92). Ethan Alston was 74th in the 60 meters (7.59) and Tyler Luster was 92nd (7.71) in the 60 meters. Robert Quillen was 39th in the shot put(30-9.50), while T.J. Jackson was 42nd in the shot put (27-7). The final rankings for the Division II LHSAA Indoor State Championships will come out this week, the top twelve relays and individuals in running events qualify, while the top sixteen in field events earn spots to the state meet. Rock is seeded fourth in the triple jump and long jump, while Moore is qualified fourteenth in the shot put. All three relays are qualified, and several individuals in the distance races are qualified too. On the boys side Luster is qualified in the long jump, while the 3200 meter relay is qualified second, and the 800 meter relay is eleventh. The falcons also have runners qualified in the 800, 1600 and 3200 meters. Sophomore Chalah Rock led the Lady Falcons and junior Logan Lucas led the boys with both posting fifth place finishes. LAKE CHARLES, LA—The Saint Thomas Aquinas Indoor Track and Field team competed in Saturday’s McNeese State High School Indoor Meet #2 in Lake Charles. Sophomore Chalah Rock led the Lady Falcons with a fifth place finish in the triple jump (33-9.50) and was eleventh in the long jump (15-8). D’Asia Moore posted a tenth place finish in the shot put (26-7.50). Yvette Miller led the girls team on the track with a seventh place finish in the 800 (2:35.06), Maggie Crawford was 21st in the 800 (2:43.24). Brynleigh Berthelot placed eighteenth in the 1600 (6:09.43), Brilee Broussard was 23rd in the 55 meters (7.99). The STA 800 meter relay team of: Broussard, Rock, Miller and Abby Bates posted a tenth place finish in (1:55.87), while the 1600 meter relay team of Miller, Bates, Rock and Crawford posted a twelfth place finish in (4:38.68). Junior Logan Lucas led the STA boys with a fifth place finish in the 3200 (10:49.15) and was tenth in the 800 (2:08.60). Jude Vitrano was 42nd in the 800 (2:24.93), while John Ross Donnes was fourteenth in the 1600 (4:58.59), David Anthon was seventeenth in the 1600 (5:02.66) and Douglas Robinson was 37th in the 1600 (5:24.32). Ethan Alston placed 35th in the 55 meters (7.07), while Devon Wilson was 55th in the 55 (7.21) and was 28th in the long jump (17-1.50). Tyler Luster was 56th in the 55 (7.23) and was 27th in the long jump (17-05). The STA 800 meter relay team of: Alston, Wilson, Vitrano and Luster posted a sixteenth place finish in (1:39.92). The STA teams will compete in next Saturday’s LSU Last Chance Qualifier in Baton Rouge and they will finish the season on February 17th at the LHSAA Division II Indoor Track and Field Championships at LSU. Saint Thomas Aquinas Boys earns fourth place finish. Girls and Boys in McNeese State Indoor Invitational. John Ross Donnes, Logan Lucas, David Anthon and Jude Vitrano win 3200 relay. HAMMOND—The Saint Thomas Aquiinas boys team posted a fourth place team finish, while the girls placed thirteenth in the team standings in Saturday's McNeese State Indoor Invitational held in Lake Charles. The Carver boys captured the team title with (57), West Jefferson was second (46), Barbe was third with (34), STA fourth with (33) and Mandeville was fifht with (30). The Lafayette girls won the team title with (81), Barbe was second(38), Mandeville third (37), while the STA girls were tied with Pineville and Sulfur at the thirteenth position with (13). The Saint Thomas boys 3200 meter relay team of John Ross Donnes, Logan Lucas, David Anthon and Jude Vitrano won the event with a time of (8:41.47). Lucas also posted a third place finish in the 3200 (10:42.42), Anthon was sixth in the 3200 (11:03.86), while Donnes was fifth in the 800 meters (2:12.19) and Vitrano was eleventh in the 800 (2:19.31). Douglas Robinson posted a fifth place finish in the 1600 (5:04.47), while Dawson Gildig was seventh in the 1600 (5:08.62). Robert Quillen placed sixth in the shot put (33-9), while Kylen Smith was tenth in the shot put (30-8). Tyler Luster was seventh in the long jump (18-3.50) and placed 26th in the 55 meter dash(7.29), while Devon Wilson was 22nd in the 55 meters(7.26). The Lady Falcons 3200 meter relay team of: Abby Bates, Nicole Francois, Brynleigh Berthelot and Madelyn Nicaud posted a second place finish with a time of (10:57.32). Bates posted a fifth place finish in the 3200(13:17.04), Berthelot was eleventh in the 1600 (6:12.73) and Nicuad was 21st in the 400 (1:08.50). De'Asia Moore posted an eighth place finish in the shot put (25-11), while Yvette Miller was eleventh in the 55 meter hurdles (10.73). Saint Thomas Aquinas Track & Field collects a pair of Runner-Up Trophies! Girls and Boys both earn Runner-Up Honors at the Region 3-2A Track and Field Meet ... Junior Will Hetzinger was named the Region 3-2A MVP. HAMMOND—Two is better than one and that was true for the Saint Thomas Aquinas girls and boys track and field squads on Wednesday as they both earned Runner-Up honors in the Region 3-2A Meet hosted at the Southeastern Louisiana University track facility in Hammond. Individual qualifers will compete in the AllState Sugar Bowl/LHSAA Outdoor Track Championships set for May 4-6 at LSU. Saint Thomas was hampered by a gusting wind throughout the meet and many did not compete because of illness. “We had a lot of kids out sick today," added Becerra. The Lady Falcons chalked up 89 team total points. Newman captured the meet title with 102 points, while Archbishop Hannan finished third with 84 and Riverside Academy had 66 points. The Falcons collected 99 team total points. Newman captured the title with 122 points. West St. John was third with 66 and Archbishop Hannan took fourth place with 44 points. Junior Will Hetzinger was named the Region 3-2A MVP. Hetzinger place first in the javelin throw with a toss of 167’, 11” and was second in the 110-meter hurdles with a time of 15.49, second in the 300-meter hurdles and ran a leg in the 4x400-meter relay that finished third. In the relay events, the team of Yvette Miller, Chalah Rock, Abby Bates and Camyrn Flanagan finished second in the 4x100 Meter Relay with a time of 51.56, and in the Girls 4x200 Meter Relay, and the team of Flanagan, Mller, Bates and Rock took second with a time of 1:49.51. In the Boys 4x400 Meter Relay the team of Jude Vitrano, Jaylen Jackson, Dejuan James and Will Hetzinger finished third clocking in at 3:37.5. The Lady Falcons were led by Meghan Becerra on the track who took second place in the 400-meter run with a time of 1:03.87 and was first in the 800-meter run with a 2:32.54 clocking. Teammate Camryn Flanagan finished second in the 200 meter dash timing in at 27.01, while teammate Yvette Miller finished third in the 300-meter hurdles with a time of 49.73. Senior Jordan Strahan and freshman Chalah Rock led the way in the field as Strahan won the high jump with a height of five feet and Rock took first place in the triple jump with a leap of 35-05.25 and second in the long jump with a mark of 16-06.5. Cravion Lewis took second in the 100-meter run with a time of 10.92 and he was second in the 200-meter with a 23.43 clocking. Teammate Jude Vitrano was third in the 800-meter run with a time of 2:05.83 and David Athon was third in the 1,600-meter with a 4:43.06 clocking. Anthon finished second in the 3,200-meter run with a time of 10:48.64 and teammate Logan Lucas was third in the same event with a 10:48.76 clocking. Glen Ferril placed third in the shot with a toss of 42-05.50. Saint Thomas Aquinas girls and boys dominate District Meet! COVINGTON, LA—The St. Thomas Aquinas girls and dominated the 2017 LHSAA 9-2A District Track and Field Championships held at the new Christ Episcopal Track and Field Complex in Covington. The top four finishers qualified for next week’s LHSAA Region 3-2A Championships to be held at the Southeastern Louisiana University Track and Field Complex in Hammond, with the field events starting at 1:00 pm and the running events will start at 4:00 pm. The STA girls scored (128), to runner-up Springfield’s (53), St. Helena was third (24) and Doyle was fourth (7). STA senior Jordan Strahan earned the field MVP with a pair of wins in the pole vault (5-0) and high jump (4-8), a pair of second place finishes in the long jump (14-10) and triple jump (31-05). STA senior Meghan Becerra was named the Track MVP with a pair of individual wins in the 400 (1:05.84) and 800 (2:38.93) and also joined Chalah Rock, Camryn Flanagan and Yvette Miller on the winning 800 meter relay (1:53.76) and also Abby Bates, Brynleigh Berthelot and Flanagan on the winning 1600 meter relay (4:27.16). The foursome of Bates, Miller, Flanagan and Rock won the 400 meter relay in (52.45). Rock also posted a pair of individual wins in the long jump (17-0) and triple jump (35-3), while Miller was the 300 meter hurdle champion (49.33). Flanagan was the 200 meter champion (26.91), Bates was a double winner in the 1600 (6:10.00) and 3200 (14:09.30), while Berthelot was second in the 3200 (14:14.50), 1600 (6:16.56) and 800 (2:51.99). Marley Vinet won the 100 meter hurdles (18.45), was second in the 300 meter hurdles (58.19) and finished third in the 100 (14.51). Jourdan Cheek qualified at the second position in the discus (69-04) and shot put (23-06) and also finished fifth in the javelin (57-04), while Cadyn Reed qualified fourth in the javelin (73-0). Madison Plaisance qualified third in the shot put (22-05) and discus (64-05). The STA boys captured the team title with (114), Springfield was second with (75), St. Helena was third (19) and Doyle was fourth (10). STA senior Glen Ferrill was a double winner in the discus (142-02) and shot put (41-04) to earn the field MVP award. STA junior Craivon Lewis earned the track MVP with a pair of wins in the 100 (11.60) and 200 (23.55) and also joined DeJuan James, Jaylen Jackson and Jude Vitrano on the winning 800 meter relay (1:34.86), and also ran a leg on the second place 400 meter relay (45.93) with Brad Lewis, Jackson and Adam Hetzinger. The 1600 meter relay team of; Jackson, James, Vitrano and John Ross Donnes won in (3:49.81). Will Hetzinger was a triple winner in the 110 hurdles (15.61), 300 hurdles (43.13) and javelin (146-02). James won the triple jump (43-02) and was second in the long jump (20-00.50). Vitrano was the 800 meter champion (2:08.65), while Tristan Robertson was second in the 800 (2:13.27). Donnes qualified second in the 400 (56.17), while Dawson Gildig was third in the 400 (56.89). David Anthon posted a pair of wins in the 3200 (10:56.60) and 1600 (4:45.77), while teammate Logan Lucas was second in the 1600 (4:49.93) and 3200 (11:28.96). Adam Hetzinger was second in the javelin (136-07), Douglas Robinson qualified third in the 200 (26.93) and Brad Lewis was fourth in the 100 (12.42). Complete results can be found at crescentcitytiming.com. Saint Thomas Aquinas girls and boys earn fifth place finishes in Strawberry Relays. Seniors Jordan Strahan and DeJuan James score top finishes. HAMMOND, LA—The Saint Thomas Aquinas girls and boys track teams earned fifth place finishes in an impressive field of 20 schools in the annual Strawberry Relays hosted at Southeastern. The Lady Falcons collected 39.50 points while the Falcons had 42. Lafayette dominated the girl’s competition winning with 144 points and John Curtis ran away with the boy’s meet posting 158 points. Senior Jordan Strahan won the girl's high jump with a mark of 5-0-0 and senior DeJuan James captured the triple jump with a leap of 43-04.00. James also scored in the long jump placing fifth with a jump of 19-00.00. Chalah Rock took third in the triple jump with a jump of 36-07.00. In the 110 hurdles Will Hetzinger placed fourth with a time of 16.16 and Marley Vinet was fifth in the girl’s race with a time of 18.74. Yvette Miller was the runner-up in the 300 meter hurdles clocking in at 48.27. Meghan Becerra took fourth in the 800 meters in a time of 2:24.22, while the girl’s relay team of Abby Bates, Cam Flanagan, Chalah Rock, and Yvette Miller place fourth in the 4x100 Meter Relay. Falcons compete in Chalmette High Schools High Flying Owls Invitational. Becerra takes first in 400 meters and DeJuan James take first in the triple jump. CHALMETTE, LA—The Saint Thomas Aquinasgirls and boys track and field teams competed in Wednesdays 2017 Chalmette High Schools High Flying Owls Invitational held in Chalmette, Louisiana. Ursuline Academy captured the girls team title with (91), Edna Karr was second (84), Cabrini third (71), Academy of Our Lady fourth (61), Chalmette fifth (59), STA sixth (51), Ben Franklin seventh (38), Louise McGehee eighth (35), Dominican ninth (33), Riverdale tenth (20) and Warren Easton (14). STA senior Meghan Becerra led the way for the girls team with a first place finish in the 400 meters (1:02.23), while Freshman Chalah Rock posted a second place finish in the triple jump (36-03) and was fourth in the long jump (16-08) and placed seventh in the 100 (13.69). Yvette Miller was second in the 300 meter hurdles (49.00) and placed tenth in the 100 (14.09). Abby Bates posted a second place finish in the 1600 (5:52.48), while Brynleigh Berthelot was fourth in the 1600 (6:05.54). Jordan Strahan posted second place finish in the high jump (4-10), while Ashlyn Alaack was sixth in the high jump (4-04). Marley Vinet was seventh in the 100 meter hurdles (18.95) and finished eleventh in the long jump (13-09.50). Senior DeJuan James led the boys team with a first place finish in the triple jump (44-04) and was fifth in the long jump (19-06). Senior Glen Ferrill posted a second place finish in the shot put (40-00.50) and was third in the discus (123-04). David Anthon finished second in the 1600 (4:47.66), while Douglas Robinson was seventh in the 1600 (5:15.14). Jude Vitrano finished second in the 400 (52.77), while Tristan Robertson was fourth in the 800 (2:08.22) and Dawson Gildig placed tenth in the 800 (2:25.63). The STA teams will return to Chalmette next Friday for the Bobby Nuss Relays. Rock, Becerra, Hetzinger, Miller collect wins in STA-Judy Baehr Relays. Girls and Boys Track and Field teams each posted fourth place team finishes in Friday’s 2017 STA-Judy Baehr Relays. HAMMOND—The Saint Thomas Aquinas High School girls and boys Track and Field teams each posted fourth place team finishes in Friday’s 2017 STA-Judy Baehr Relays held at the SLU Track and Field Complex in Hammond. Walker captured the girls team title with (105) points in the field of seventeen teams. Parkview Baptist was second (88), Isadore Newman was third (81), STA fourth (60), followed by Loranger (45), St. Katherine Drexel Prep (42), Live Oak (25), Archbishop Hannan (20), St. Scholastica Academy (19), Metairie Park Country Day (17), Northlake Christian (15), Springfield (14), Runnels (9), Covenant Christian Academy (7), Westminster Christian Academy (6), Catholic Pointe Coupee (4) and Christ Episcopal (1). Loranger’s Kiana Foster was named the Overall MVP, MiKayla Ruhl (Newman) was the Track MVP and Noel Wilson (Live Oak) was named the Field MVP. Saint Paul’s edged-out Walker (102-99) to capture the boys team title, Loranger was third (84), STA fourth (50), followed by Isadore Newman (44.50), Covenant Christian Academy (30), Parkview Baptist (29), Archbishop Hannan (25), Springfield (18), Northlake Christian (14), Metairie Park Country Day (12), Christ Episcopal (6), Pine (4), Runnels (4), Catholic PC (2.50) and Live Oak (2) in the field of sixteen boys teams. Walker’s Landon Harper was named the Overall MVP, while Parkview Baptist’ Tzuriel Pedigo was named the Field MVP and St. Paul’s Eric Coston was named the Track MVP. Freshman Chalah Rock led the lady falcons in the field events with a first place finish in the triple jump (34-07) and she was third in the 300 meter hurdles (52.28), while Jordan Strahan was second in the high jump (5-0) and was fifth in the triple jump (31-03). Meghan Becerra and Yvette Miller led the STA girls on the track, Becerra captured the 800 meters (2:26.21), while Miller was the 300 meter hurdle champion (49.29) and she was also fourth in the 100 meter hurdles (18.57). Brynleigh Berthelot was eighth in the 1600 (6:13.79), Marley Vinet was seventh in the 100 meter hurdles (19.31), Abby Bates was tenth in the 800 (2:42.43). The STA girls 800 meter relay team of: Rock, Becerra, Bates and Miller placed third (1:51.43), while the same foursome was fourth in the 1600 meter relay (4:26.84). On the boys side Will Hetzinger led the falcons on the track, capturing the 110 meter hurdles (15.72) and was third in the 300 meter hurdles (42.27), while Cravion Lewis was second in the 200 meters (23.62) and posted a third place finish in the 100 meters (11.55). Jude Vitrano was fourth in the 800 (2:06.04) and Logan Lucas was fourth in the 1600 (4:47.19) and was eighth in 800 (2:11.14). David Anthon was fourth in the 3200 (10:23.97) and Tristan Robertson was fifth in the 3200 (10:41.89). Glen Ferrill led the falcons in the field events with a third place finish in the discus (121-0) and was eighth in the shot put (39-9). Adam Hetzinger was tenth in the javelin (128-10). Saint Thomas Ladies post fourth place finish at State Meet. Boys capture second 3200 meter relay and finish 11th overall. BATON ROUGE—The Saint Thomas Aquinas girls posted a fourth place team finish in Saturday’s 2017 LHSAA Indoor State Track and Field Championships held at the LSU Indoor facility in Baton Rouge. Brusly captured the team title (58), Episcopal was second (40), Lusher Charter third (31), STA fourth (27), Sacred Heart-New Orleans and Holy Savior Menard fifth (26), West Feliciana seventh (22), Glen Oaks eighth (21), Parkview Baptist ninth (19.75) and St. James was tenth (19) in the field of thirty-three teams that scored in the meet. Freshman Chalah Rock led the lady falcons with a second place finish in the long jump (16-02.25) and placed fourth in the triple jump (34-05.75), while Senior Jordan Strahan posted a third place finish in the high jump (5-1). Camryn Flanagan posted a thirteenth place finish in the 60 meter dash (8.46) and Nicole Francois was ninth in the 3200 meters (12:59.68). The Lady Falcon 3200 meter relay team composed of; Yvette Miller, Maggie Crawford, Francois and Meghan Becerra also made it to the podium at the third position (10:14.55). The 1600 meter relay team of Flanagan, Becerra, Crawford and Miller placed fifth (4:21.64), while the 800 meter relay team of: Rock, Flanagan, Crawford and Miller placed sixth (1:52.18). On the boys side, Episcopal captured the team title with (78), West Feliciana was second (40), Berwick third (38), Christian Life fourth (34), Franklin fifth (27), Parkview Baptist and Newman sixth (22), Southern Lab eighth (18), Jehovah-Jirah ninth (16), Delasalle tenth (11), Donaldsonville eleventh (10) and St. Thomas Aquinas was eleventh (9) in the field of twenty-eight scoring teams. The 3200 meter relay team of Logan Lucas, John Ross Donnes, Jude Vitrano and David Anthon posted a second place finish (8:36.28) to make it to the podium. Will Hetzinger placed sixth in the 60 meter hurdles (8.99), Tristan Robertson was ninth in the 1600 (4:59.81), Lucas was tenth in the 3200 meters (11:09.52), Anthon was eleventh in the 3200 (11:09.88) and Senior Glen Ferrill placed eleventh in the shot put (43-0). The Saint Thomas Aquina teams will open-up the outdoor season next Friday at the SLU Track and Field Complex with the STA Season Opener, with the field events beginning at 3:00 pm and the running events will start at 3:30 pm. STA will be joined by Loranger, St. Scholastica Academy, Bogalusa, Northlake Christian, John Curtis, Kentwood, St. Katherine Drexel, Parkview Baptist, St. Charles Catholic, Covenant Christian and First Baptist next Friday. Ladies compete in LSU Indoor High School qualifier held in Baton Rouge. Ladies relay teams posted a pair of sixth place finishes. BATON ROUGE—The St. Thomas Aquinas girls relay teams posted a pair of sixth place finishes in Saturday's 2017 LSU Indoor High School qualifier held in Baton Rouge. The lady falcon 3200 meter relay team of: Meghan Becerra, Yvette Miller, Nicole Francois and Brynleigh Berthelot ran (10:48.35) to place fourth. The 1600 meter relay team of: Chalah Rock, Maggie Crawford, Miller and Becerra ran (4:27.15) to finish sixth. The 800 meter relay team of: Rock, Crawford, Miller and Abby Bates finished twenty-fifth in (1:58.43). Francois ran (5:48.33) to finish ninth in the 1600 meters, while Berthelot was thirty-sixth in the 1600 (6:27.56). Rock also posted a fourteenth place finish in the triple jump (32-05.50) and placed twenty-ninth in the long jump (12-03), while Jordan Strahan placed fourteenth in the high jump (4-08) and placed twentieth in the triple jump (30-2.75). Miller also placed twentieth in the 60 meter hurdles (10.84). Glen Ferrill led the STA boys with an eighth place finish in the shot put (43-01), while Will Hetzinger posted the eighth fastest time in the 60 meter hurdles (8.86). Logan Lucas was sixteenth in the 1600 (4:52.26) and Dawson Gildig placed 45th in the 1600 (5:12.60). Jude Vitrano placed 29th in the 800 (2:17.45), John Ross Donnes was 32nd in the 800 (2:17.76) and Cravion Lewis finished 67th in the 60 meter dash (7.58). The STA teams will compete in next weeks McNeese State High School II Invitational in Lake Charles. Ladies post third place finish at State! 400 meter relay team of Yvette Miller, Flanagan, Bates and Madison Lymon also finished second in a season best time of 50.73. Lady Falcons collect 45 points. Senior Brady Becerra led the Saint Thomas boys with a pair of third place finishes in the 110 meter hurdles (14.75) and 300 meter hurdles (39.64). BATON	ROUGE —The Saint Thomas Aquinas girls posted a third place team finish in Friday's LHSAA Class 2A Track and Field Championships, while the STA boys were fourteenth. Episcopal won the girls division with (101), Madison Prep was second (75), STA third (45), Ouachita Christian fourth (28), Christian Life fifth (26), Notre Dame sixth (22), followed by Menard (20), West St. Mary (20), Country Day (19), Delcambre (18), Archbishop Hannan (16), Jonesboro-Hodge (15), Oakdale (14), Catholic New Iberia (13) and Louise McGehee placed fifteenth (11). The Lady Falcon 800 meter relay team of Destiny Williams, Maggie Tilyou, Camryn Flanagan and Abby Bates posted a second place finish in a season best time of (1:47.71). The 400 meter relay team of Yvette Miller, Flanagan, Bates and Madison Lymon also finished second in a season best time of (50.73). The 1600 meter relay team consisted of : Williams, Crawford, Patricia Todd and Miller, they also made it to the podium at the third position (4:08.09). Williams was the only STA individual to make it to the podium at the third position in the 800 meters (2:25.62). Crawford was fifth in the 400 (1:01.91), Flanagan placed fifth in the 200 (26.41), Todd was fifth in the 300 meter hurdles (48.80) and Miller was sixth in the 300 hurdles (49.62). Jordan Strahan posted a fourth place finish in the high jump (5-0), Regan Bolton was fourth in the discus (99-03) and eighth in the shot put (31-04), while Lymon was fifth in the discus (98-06). On the boys side of competition, Episcopal won with (96), followed by West St. John (36), Dequincy (33), Ouachita Christian (28), East Feliciana (28), Madison Prep (26), Red River (26), Newman (24), Oakdale (23), Riverside Academy (21), Catholic New Iberia (18), Rayville (18), Pickering (16), STA was fourteenth (15) and Lakeside (14) was fifteenth. Senior Brady Becerra led the STA boys with a pair of third place finishes in the 110 meter hurdles (14.75) and 300 meter hurdles (39.64) both were seasonal best performances for him. Mason Miller jumped his personal best for the fifth position in the pole vault (12-06), while Edwin Alexander scored at the sixth position in the shot put (44-11.50). Will Hetzinger placed seventh in the 110 hurdles (15.88), Jude Vitrano was seventh in the 800 (2:07.90), Dawson Gildig was seventh in the 3200 (10:37.46) and Logan Lucas was eighth in the 1600 (5:02.25). Ladies qualify nine, boys eight as Saint Thomas sweeps Regionals! Lady Falcons sweep all three relays. HAMMOND—The Saint Thomas Track and Field Team qualified 17 athletes en route to sweeping the boys and girl's Regional Team Titles. The Lady Falcons scored 132 points, while the Falcons racked up 104 points to secure the title. The Saint Thomas girls qualified nine girls, sweeping all three relays, qualifying athletes in four different field events, putting runners in the 200, 400, 800 and a pair of athletes in the 300 meter hurdles. The Lady Falcons scored (132) over runner-up Archbishop Hannan with (79), while Isadore Newman was third (62), followed by Louis S. McGehee (61), Riverside Academy (47), Metairie Park Country Day (38), St. Mary’s Academy- New Orleans (26), West St. John (23), St. Charles Catholic (19), Haynes Academy (15), Sophie B. Wright (14), Thomas Jefferson (11), WL Cohen (10), Springfield (7), South Plaquemines (6), Fisher (3), Northlake Christian (3) and Algiers Tech (2). St. Thomas Aquinas Sophomore Yvette Miller earned the Track MVP with a victory in the 300 meter hurdles (49.21), a fourth place finish in the 100 meter hurdles (18.54) and also ran on the winning 400 meter relay and 800 meter relay. Miller joined, Destiny Williams, Camryn Flanagan, and Abby Bates on the winning 800 meter relay (1:49.20), while the foursome of Madison Lymon, Williams, Bates and Flanagan won the 400 meter relay in (51.43). The team of Williams, Bates, Maggie Crawford and Patricia Todd won the 1600 meter relay in (4:13.28). Meghan Becerra captured the 800 meter title in (2:28.41), while Williams was a close second in (2:28.61), Jordan Strahan won the high jump (4-10), qualified third in the triple jump (33-04) and was ninth in the long jump (14-05.25) while Todd was second in the 300 meter hurdles (49.53). Crawford won the 400 (1:01.65), Lymon won the discus (102-10) and was ninth in the shot put (28-04) and placed twelfth in the 100 (13.79), while Regan Bolton had a pair of second place finishes in the shot put (32-05) and discus (99-10). Flanagan qualified second in the 200 (27.27) and was eighth in the 100 (13.48), while Bates was fifth in the 200 (27.94). Ellen Gambel placed eighth in the 1600 (6:17.67), Brynleigh Berthelot was tenth in the 1600 (6:43.82), Jordyn Neal was tenth in the 3200 (14:30.65) and Ashlyn Alack was eleventh in the high jump (4-02). The Saint Thomas boys qualified eight athletes, they won three field events, qualified a pair of hurdlers and qualified runners in the 800, 1600 and 3200. The STA boys held-off the Newman boys (104-94) to capture the team title, followed by West Saint John (71), Riverside Academy (55), Country Day (36.5), Archbishop Hannan (34), Thomas Jefferson (32), St. Charles Catholic (32), Northlake Christian (29), Haynes Academy (19), South Plaquemines (17), Sophie B. Wright (10), Springfield (7), Pope John Paul (6), Fisher (5.5), Cohen (2), Doyle (2) and St. Helena Central (2). Cameron Dantzler was a double winner for the Falcons in the long jump (23-06.75) and triple jump (44-03) to earn the Field MVP. Brady Becerra also earned a pair of wins in the 300 meter hurdles (40.48) and 110 meter hurdles (15.45), while Mason Miller was the pole vault champion (11-06) and Edwin Alexander qualified at the second position in the shot put (45-01.50) and was also thirteenth in the discus (83-08). Jude Vitrano qualified at the second position in the 800 (2:08.64), Logan Lucas was second in the 1600 (4:47.96) and was fourth in the 3200 (11:30.00), Dawson Gildig was second in the 3200 (10:46.70) and Will Hetzinger was third in the 110 meter hurdles (16.39), finished fourth in the 300 hurdles (43.07) and was ninth in the javelin (120-07). Glen Ferrill was fifth in the discus (105-01) and placed eighth in the shot put (36-08.50), and David Anthon placed sixth in the 800 (2:12.70). Chris Freese was sixth in the 400 (54.72), Preston Richardson finished eighth in the 200 (24.45) and Adam Hetzinger was thirteenth in the javelin (115-06). The 1600 meter relay team of: Alberto Valenzuela, Tomiek Williams, Freese and Vitrano placed fourth (3:47.47). The 800 meter relay team of: Freese, Vitrano, Becerra and Richardson placed eighth with a time of (1:37.14). Saint Thomas Track & Field girls and boys earn District Titles! Jordan Strahan earned the Ladies Field MVP award while Camryn Flanagan and Yvette Miller were co-track MVP’s. Cameron Dantzler earns Boys Field MVP. COVINGTON—The Saint Thomas Girls and Boys squads combined to collect a pair of 9-2A District Titles Tuesday as the Lady Falcons rolled up 144 points and the Falcons totaled 131 points to finish first. The Saint Thomas Aquinas girls captured the team title in Tuesday’s District 9-2A track and field championship with a total of (144) points over runner-up Springfield with (44), St. Helena Central was third (29) and Doyle placed fourth (15). The meet was held at the St. Scholastica Academy Track and Field Facility in Covington. STA’s Jordan Strahan earned the Field MVP award with four wins in the high jump(4-10), pole vault(5-0), triple jump (30-07) and long jump (14-10.25). Camryn Flanagan and Yvette Miller were co-track MVP’s. Flanagan won the 100 (13.27) and 200 (27.30), while Miller won the 100 meter hurdles (18.15) and 300 meter hurdles (50.23). Madison Lymon earned the Overall MVP with a win in the discus(100-09), a second place in the 100 (13.74), a third place finish in the shot put (30-6.25) and a leg on the winning 400 meter relay. The STA girls captured all three relay titles. The team of Abby Bates, Lymon, Patricia Todd and Flanagan won the 400 meter relay (51.71). The team of: Bates, Meghan Becerra, Destiny Williams and Maggie Crawford won the 800 meter relay (1:51.67), while the team of: Bates, Todd, Becerra and Crawford won the 1600 meter relay (4:24.38). Ellen Gambel posted a pair of wins in the 1600 (6:15.06) and 3200(13:59.06), while Crawford won the 400 (1:03.09), Becerra was the 800 meter champion (2:31.27) and was the 400 meter runner-up(1:06.66). Bates was second in the 200 (27.94), Williams was second in the 800 (2:35.50), Brynleigh Berthelot was second in the 1600 (6:15.39) and Jordyn Neal was second in the 3200 (14:46.41). Patricia Todd was second in the 300 meter hurdles(51.11), Ashlyn Alack was second in the high jump (4-04), Regan Bolton posted three second place finishes in the triple jump(28-02), shot put (33-04.75) and discus (97-0). Alexis Borne placed fifth in the javelin(55-09), while Anna Parker was sixth in the javelin (54-07). The Saint Thomas boys scored (131) to capture the District 9-2A Championship over runner-up Springfield (55), St. Helena was third (48) and Doyle was fourth (14). Cameron Dantzler earned the Field MVP with a pair of wins in the long jump (22-0) and triple jump (42-0) and also won the 100 meters (11.63) and also joined Brady Becerra, Chris Freeze and Brad Lewis on the winning 400 meter relay (44.71). Becerra was the Overall MVP with a pair of wins in the 110 meter hurdles (15.90) and 300 meter hurdles (42.82) and also ran on the second place 800 meter relay with Adam Hetzinger, Freese and Preston Richardson (1:38.42) and was on the winning 400 meter relay. Logan Lucas earned the track MVP award with a win in the 1600 (5:02.56) and was second in the 3200 (11:54.08). The 1600 meter relay team of: Freeze, Tomiek Williams, Jude Vitrano and David Anthon won in (3:45.95). Edwin Alexander won the shot put (44-02) and was third in the discus (96-02), while Glen Ferrill was the discus champion (104-06) and placed second in the shot put (37-09). Vitrano was the 800 champion (2:10.79), Freese won the 400(53.90), Dawson Gildig won the 3200 (10:31.74) and Mason Milller won the pole vault(8-0). Richardson posted a pair of second place finishes in the 100 (11.81) and 200 (24.73), Anthon was second in the 800 (2:16.82) and 1600 (5:37.91) and Williams was third in the 400 (56.88). Will Hetzinger was second in the 110 hurdles (16.46) and 300 hurdles (45.13) and was third in the javelin (128-11.50), while Adam Hetzinger was fourth in the javelin (126-04), and Hunter Dupre placed sixth in the 200 (28.71). Saint Thomas Track & Field girls and boys teams place sixth and seventh respectively. Senior Cameron Dantzler set a new Division II State record in his winning long jump of (23-05.50). Destiny Williams led the Lady Falcons with a win in the 800 meters. LAKE CHARLES—The Saint Thomas Aquinas girls track team posted a sixth place team finish in Saturday’s LHSAA Division II Indoor State Championships held at LSU in Baton Rouge. Lusher captured the team title with (49), Episcopal was second (46), followed by Parkview Baptist (30), Brusly (29), Ascension Catholic (28) and STA (27) in a field of 27 teams. Saint Thomas senior Destiny Williams led the lady falcons with a win in the 800 meter (2:26.66), while sophomore teammate Maggie Crawford also made the podium at the third postion (2:29.39). The lady falcon 3200 meter relay team of Williams, Crawford, Meghan Becerra and Abby Bates also posted a third place finish in (10:32.33). The 1600 meter relay team of Williams, Becerra, Bates and Crawford placed fourth in (4:19.92) and the 800 meter relay team of Williams, Crawford, Bates and Camryn Flanagan posted a sixth place finish in (1:51.30). Madison Lymon placed eleventh in the shot put (28-07). Brynleigh Berthelot was twelfth in the 1600 (6:18.60). The Saint Thomas boys placed seventh in the team standings, while Episcopal won with (47), followed by Lusher (42), Franklin (38), Southern Lab (28), Sumner (26), Glen Oaks (21) and STA (20) in the field of 32 teams. Senior Cameron Dantzler set a new Division II State record in his winning long jump of (23-05.50), while DeJuan James was eighth(19-06.25), James was tenth in the triple jump (40-01.50) and Dantzler was twelfth in the triple jump (39-08.25). Senior Brady Becerra posted a third place finish in the 60 meter hurdles (6.56), while Senior Edwin Alexander posted a fourth place finish in the shot put (43-0), while Glen Ferrill was twelfth (38-08). The 800 meter relay team of Becerra, Danzler, Edward Coop and Carlos Bell placed eighth (1:35.56); the 3200 meter relay team of Jude Vitrano, Chris Freese, Alberto Valenzuela and David Anthon posted a seventh place finish in (8:59.28), while the 1600 meter relay team of Becerra, Vitrano, James and Freese posted an eleventh place finish (3:44.29). Dawson Gildig was twelfth in the 3200 (12:12.34). Saint Thomas Track & Field competes in McNeese State University High School II LHSAA indoor qualifier. Dantzler collects second place finish in the long jump (22-5.25) and was fourth in the triple jump (43-02.50). LAKE CHARLES—Local athletes competed in the McNeese State University High School II LHSAA indoor qualifier in Lake Charles on Saturday. St. Thomas Aquinas Senior Cameron Dantzler posted a second place finish in the long jump (22-5.25) and was fourth in the triple jump (43-02.50), while teammate DeJuan James was seventh in the triple jump (40-11.50) and placed sixteenth in the long jump (18-11). Dantzler joined Brady Becerra, Chris Freese and Edward Coop on the second place 800 meter relay team with a time of (1:37.07). Becerra, James, Freese and Will Hetzinger teamed up to finish seventh in the 1600 meter relay (3:42.11). Becerra posted a fifth place finish in the 55 meter hurdles (8.00), while Hetzinger was eleventh in the 55 meter hurdles (8.61). Senior Edwin Alexander posted a third place finish in the shot put (44-11), while Glen Ferrill was eighteenth (36-10). Logan Lucas placed thirteenth in the 3200 (11:09.31), while David Anthon placed fifteenth (11:12.66). Jude Vitrano placed 25th in the 1600 (5:02.63), John Ross Donnes was 38th (5:18.24) and Hunter Dupree placed 44th (5:33.09). Tomiek Williams was 46th in the 400 (1:02.35), while Preston Richardson was 66th (1:09.44). Sainbt Thomas sophomore Maggie Crawford led the girls team with a fourth place finish in the 800 meters (2:29.13), while Destiny Williams was eighth (2:34.52) and Meghan Becerra was eighteenth (2:40.54). Yvette Miller placed seventh in the 1600 meters (5:57.10), while Brynleigh Berthelot was fourteenth (6:20.82) and Jordyn Neal was sixteenth (6:25.15). Ellen Gambel posted a thirteenth place finish in the 3200 meters (13:29.15). Madison Lymon placed eleventh in the shot put (28-07) and was 39th in the 55 meters (8.34). Camryn Flanagan placed 20th in the long jump (14-1) and was 27th in the 55 (8.12), while Leighanne O’Dowd finished 55th in the 55 (9.01). The 800 meter relay team of: Flanagan, Crawford, Williams and Lymon placed eighth (1:56.74). The 3200 meter relay team of: Berthelot, Neal, Gambel and O’Dowd was ninth (13:10.04). The STA teams will be competing in next week’s LSU Last Chance Qualifier in Baton Rouge on Saturday. Saint Thomas Track & Field competes at LSU Indoor. BATON ROUGE—The Saint Thomas Aquinas girls 1600 meter relay team of: Destiny Williams, Maggie Crawford, Yvette Miller and fifteenth Abby Bates posted an eighth place finish in (4:17.95) in Saturday's LSU High School Indoor Qualifier in Baton Rouge. The same foursome also posted a fifteenth place finish in the 800 meter relay(1:54.95). Crawford also posted a thirteenth place finish in the 800 meters(2:33.62), while Meghan Becerra was 23rd in the 800 (2:40.24). Courtney Dawsey posted a nineteenth place finish in the 60 meter hurdles(10.64), Jordyn Neal was 23rd in the 3200 (14:26.73) and Brynleigh Berthelot was 43rd in the 1600 (6:28.67). DeJuan James led the STA boys with a thirteenth place finish in the triple jump(40-05.00) and was 51st in the 400 (56.87). Will Hetzinger was thirteenth in the 60 meter hurdles (9.27), Dawson Gildig finished eighteenth in the 3200 (10:54.44), while Logan Lucas was 31st in the 3200 (11:25.64). Glen Ferrill was 22nd in the Shot Put (38-08.75), David Anthon placed 49th in the 800(2:22.29) and Chris Freese was 50th in the 400 (56.82). The STA Track team will be competing in next weeks McNeese State High School Qualifier in Lake Charles. Saint Thomas Ladies earn LHSAA Class 2A State Runner-Up honors. BATON ROUGE—The final team score read Episcopal 81, the Saint Thomas Lady Falcons 70, but the margin was actually much closer as the Lady Falcons earned LHSAA Class 2A State Runner-up honors Friday at LSU’s Bernie Moore Track Stadium. Saint Thomas lost six points when its third-place 4x200-meter relay was disqualified for a zone violation on the second exchange. The Lady Falcons bounced back from the miscue to pull to within nine going into the final event, the 4x400, but Episcopal’s Rachel Misher ran a blistering final lap to seal the win for the Lady Knights. Meghan Becerra won a state championship in the 800 meters and finished second in the 400 for St. Thomas. The Lady Falcons also had a pair of state runners-up in Crystal Rock (triple jump) and Madison Lymons (discus). Cameron Dantzler gave the STA boys a Class 2A state title in the long jump while Kentwood’s Shyheim Carter overcame injuries and a slow start to sprint to the Class 1A 100 meters state championship. The Falcons, behind Dantzler and Brady Becerra, finished third in 2A with 34 points. Episcopal ran away from the field in repeating as the state champion with 113 points with Sophie B. Wright second with 48. Becerra and Destiny Williams helped St. Thomas rally from the miscue in the 4x100 with a one-three finish in the 800. Competing at state for the first time, she took the lead in the first 400 meters, then out-ran Calvary Baptist’s Hailey Hesterman down the stretch to win in a personal-best 2:19.64. Hesterman, the 2A record holder, came in at 2:21.83 with Williams coming out of the ninth seed to finish in 2:23.82. Becerra went on to take second in the 400 in 59.24, coming in behind Sterlington’s LaTasha English’s 58.05. Also finishing second for the Lady Falcons were Crystal Rock in the triple jump and Madison Lymon in the discus. Rock jumped 35-06 with Oakdale’s Heaven Terrell winning at 36-10. Rock earlier finished eighth in the long jump (15-10.5). Lymon (104-08) and Regan Bolton (98-03) gave St. Thomas a two-three finish in the discus. Darien Phillips of Oakdale took the state title at 108.05. Lymon was also seventh in the shot put (29-05). Bobbi Amar was fourth in the 3,200 (12:01.09) and fifth in the 1,600 (5:33.27). Courtney Dawsey added fourth-place finish in the 300 hurdles in 47.38. Westminster’s Ivy Cains was the state champion in 45.35. Jordan Strahan started the scoring for the Lady Falcons with a fourth-place finish in the high jump, clearing 4-10. The 4x100 relay of Dawsey, Lymon, Rock and Yvette Miller took fifth in 50.89. In the boys’ meet, Dantzler easily captured the long jump title, winning by 6.25 inches with a school-record jump of 23-03.75. Dantzler had won the indoor title earlier this year. “It feels good. I’ve been working on it and I had every confidence I could win,” said Dantzler, who finished second at state in 2014. Dantzler went on to take third in the triple jump at 44.03.5, finishing behind Episcopal’s Jeremiah Mayes (44-09.5) and Red River’s Dahndre Washington (44-03.5). Brady Becerra had a pair of runner-up finishes in the hurdles for the Falcons. His 15.14 came in behind Oakdale’s Darion Dunn’s 14.55 in the 110 while Episcopal’s Caden Dickerson nipped him 39.81-39.98 in the 300. Teammate Will Hetzinger was eighth in the 300 (42.89). Mason Miller cleared 11-6 to finish sixth in the pole vault. Dylan Dunaway was eighth in the 800 (2:10.40). The Falcons’ 4x200 relay of Chris Freese, Becerra, Edward Cooper and Dantzler finished sixth (1:34.99). Saint Thomas Girls and Boys teams sweep District 7-2A Championships! Ladies rule the awards stand taking all the MVP trophies. COVINGTON—The Saint Thomas Falcons Track and Field Teams flew past the District 7-2A competition as the girls and boys squads earned top honors at the recent Championship Meet hosted at the SSA Track in Covington. The Lady Falcons racked up 186 points to top Runnels with 83 and Springfield with 53. The Falcons collected 139 points to finish ahead of Runnels with 125 and Springfield with 67. The Saint Thomas Ladies swept the MVP Awards as Jordan Strahan was named Field MVP and Meghan Becerra Track MVP and Madison Lymon took home the top honor as Overall MVP. On the boys side, Mason Valure was named Field MVP and Brady Becerra Track MVP, while Cameron Dantzler took top honors as the Overall MVP. Judy Baehr Relays ... Becerra earns overall MVP and Rock takes MVP Field Honors! Ladies earn runner-up honors and boys finish fourth. HAMMOND—The Saint Thomas Track and Field Teams impressed in a field of thirteen teams Friday at the annual Judy Baehr Relays as the girls finished second and the boys fourth in the team competition and junior Brady Becerra was named Boys Overall MVP and senior Crystal Rock Girls Field MVP. The Walker Wildcats captured both the Girls and Boys team titles with the lady Wildcats scoring 128 points, while Saint Thomas and Chalmette tied with 110 each. The Walker boys rolled up 107 points followed by Chalmette with 90, DeLa Salle with 89 and Saint Thomas 69. Rock won the Girls Long (16-04.50) and Triple Jumps (33-06.50) to earn Field MVP honors, while Becerra was named the Overall Track MVP finishing tops in the 110 (15.50) and 300 meter hurdles (41.37) along with leading off the 4x400 Meter Relay team that finished first (3:42.23). Will Hetzinger finished just behind Becerra in the 300 meters hurdles with a time of 45.35 giving the Falcons a one-two finish in the event. The Lady Falcons collected a pair of wins and a second place finish in the relays winning the 4x200 Meter Relay with a time of 1:49.92 (Destiny Williams, Madison Lymon, Maggie Crawford, and Meghan Becerra) and the 4x400 Meter Relay in a time of 4:09.05 (Crystal Rock, Destiny Williams, Maggie Crawford, and Meghan Becerra). The Saint Thomas Ladies were second in the 4x100 Relay finishing with a time of 52.61 (Crystal Rock, Leighanne O’Dowd, Lucy Hoffer, and Madison Lymon). The boys 4x400 Relay Meter team of Becerra, Chris Freese, Dylan Dunaway, and Will Hetzinger cross the line first with a time of 3:42.23. Freese was seventh in the 200 Meter Dash (24.13). Becerra (59.23) and Williams (1:00.58) finshed one-two in the Girls 400 Meter Dash, while Crawford took first in the Girls 800 Meters (2:32.07). In the distance events, senior Bobbi Amar took first with a time of 12:15.91, and Jordyn Neal finished thirteenth in the 1600 Meter Run (6:42.11). On the boys side Clayton Ourso finished fourth (11:02.26) in the 3200 Meters followed by Sawson Gildig in fifth (11:04.97). In the field, Mason Valure took second in the Boys Shot Put (40-09.00) and fifth in the Discus (191-09),while Lymon was fourth on the girls side with a shot toss of 28-07.50 and Mason Miller (11-00.00) finished second in the Pole Vaught. Girls and Boys Teams impress again at LHSAA State Indoor! Ladies relay teams post wins, Becerra wins 60 meter hurdles, and Cameron Dantzler wins long jump. BATON ROUGE—The Saint Thomas girls and boys track teams impressed once again at the annual Indoor LHSAA State Track and Field Meet hosted at the B. Moore Track & C. Maddox Field House Saturday. The Lady Falcons came within a whisker of bring home hardware finishing just one point behind Hamilton Christian and Episcopal who tied for first with 50 points in a field of 27 teams, while the boys placed fourth with 31 points in a field of 32 teams. John Curtis took first with 68 points and Franklin was second with 42 points. The Lady Falcons Relay Teams collected a pair of top finishes as the team of Destiny Williams, Meghan Becerra, Maggie Crawford, and Crystal Rock won the Girls 4x400 Meter Relay (4:12.58), while the team of Destiny Williams, Meghan Becerra, Maggie Crawford, and Bobbi Amar won the Girls 4x800 Meter Relay (10:13.82). Senior Bobbi Amar took third in the 3200 meters with a time of 12:07.56, and Courtney Dawsey was sixth in the 60 meter hurdles with a time of 10:50, while Crystal Rock finished eighth in the long jump. Juniors Cameron Dantzler and Brady Becerra collected individual state titles on the boys side as Dantlzer won the long jump (22-07.00) and Becerra was tops in the 60 meter hurdles (8.56). Dantzler also claimed runner-up honors in the triple jump (43-05.75). In the field, junior Mason Miller finished ninth in the pole vaunt. Crystal Rock placed fourth in the triple jump (33-00.25), Jordan Strahan fifth in the high jump (4-11.00), Meghan Becerra was second in the 800 (2:23.79), and Destiny Williams was third in the 800 (2:25.32), Madison Lymon was fifth in the shot put (28-06.00). The Boys 1600 relay of Brady Becerra, Chris Freese, Will Hetzinger, Alberto Valenzuela with a time of (3:45.15). Boys 3200 meter relay of Dylan Dunaway, Chris Freese , Alberto Valenzuela and Clayton Ourso were fifth (9:00.53). 3200 meter relay team wins at McNeese State University High School Invitational. Amar posts second place finish in the 1600 meters. BATON ROUGE—The Saint Thomas Aquinas High School girls 3200 meter relay team of Destiny Williams, Bobbi Amar, Meghan Becerra and Maggie Crawford came out victorious in Saturday's McNeese State University High School Invitational held in Lake Charles. The Lady Falcons posted a winning time of (10:29.34), Williams led off the relay with a 2:39 leg, followed by Becerra with a 2:29 leg, Crawford ran 2:39, while Amar anchored with a 2:38 leg for the victory over runner-up John Curtis at 10:46.48. Amar came back after the relay to post a second place finish in the 1600 meters (5:43.26), while Becerra was third in the 400 (1:05.95), Williams was fifth in the 40 (1:06.09) and Crawford posted a seventh place finish in the 80(2:44.33). Jordan Strahan posted a fifth place finish in the high jump (4-6) and was sixteenth in the long jum(14-6), while Crystal Rock placed seventh in the triple jump (31-06.50) and twelfth in the long jump (15-2.50) and Madison Lymon added an eleventh place finish in the shot put (25-07). Distance runner Ellen Gambel was twelfth in the 1600 (6:33.86), while teammate Jordyn Neal was fourteenth in the 1600 (6:37.12). The Saint Thomas boys 3200 meter relay team of: Hunter Dupre (2:32), Chris Freese (2:18), Clayton Ourso(2:27) and Alberto Valenzuela (2:21) posted a sixth place finish in (9:40.03). Ourso came back and placed 26th in the 1600 (5:30.50), Dupre was 35th in the 1600 (5:41.51), Freese finished eleventh in the 400 (56.41), while Valenzuela was 34th in the 400 (1:01.12) and Tomeke Williams was 43rd in the 400 (1:07.01). Jude Vitrano placed 28th in the 800 (2:32.59), David Anthon was 31st in the 800 (2:34.90) and Alex Wisecarver finished 33rd in the 800 (2:36.13). Mason Valure led the Falcons in the field events with a tenth place finish in the shot put (38-06) and Glen Ferrill was seventeenth in the shot put (32-11). The STA teams will be competing at LSU next week in Baton Rouge. Amar third in LSU Classic. Saint Thomas Aquinas Indoor Track season underway. BATON ROUGE—Senior Bobbi Amar led the STA girls in Saturday's LSU HS Track and Field Classic held in Baton Rouge. Amar posted a third place finish in the 3200 meters (12:00.59). Crystal Rock was fifth in the triple jump (31-10.75) and was twelfth in the long jump (15-03.75), while Madison Lymon placed eleventh in the shot put (27-0). Maggie Crawford posted a fifteenth place finish in the 800( 2:39.99), while Ellen Gambel was 25th in the 1600 (6:32.64) and Jordyn Neal was 28th in the 1600 (6:37.23). Patricia Todd was 20th in the 400(1:04.71), while Destiny Williams was 25th in the 400 (1:05.08). Junior Cameron Dantzler posted a third place finish in the long jump (21-8) and was sixth in the triple jump (41-0.75) to lead the STA boys team. Brad Lewis was 59th in the 60 (7.63), Chris Freese posted a 30th place finish in the 400 (55.78). Dylan Dunaway placed 35th in the 800(2:21.28) and Alberto Valenzuela was 36th in the 800 (2:21.71). Clayton Ourso finished twelfth in the 3200 (11:25.50) and Mason Valure was fifteenth in the shot put (40-11). The STA team will be competing in Lake Charles next week at the McNeese State High School Invitational on Saturday. Falcon Track & Field wraps up season with banquet. Saint Thomas Aquinas honors Track & Field athletes at annual Banquet. HAMMOND—The Saint Thomas girls and boys celebrated their Indoor and Outdoor seasons on Thursday night in the STA Commons at their Annual Track and Field Banquet. Saint Thomas Senior Craig Rock (Garden City CC signee) earned the Indoor MVP and the Track MVP awards as he set indoor records in the Division II 400 meters and 60 meter hurdles, Rock also set a new composite record in the 300 meter hurdles outdoors and was the 110 meter hurdle champion. Saint Thomas senior Avrielle Steward earned the Outdoor Track MVP for the girls as she highlighted the state meet with a second place finish in the 400 and led the Saint Thomas girls to runner-up finishes in the 800 and 1600 meter relays that she anchored. Crystal Rock and Bobbi Amar earned the Indoor MVP awards as they each made it to the podium in their two individual events indoors. Amar also earned the Captains Award for the 2014 season. Saint Thomas senior Anna Miller (Springhill signee) earned the Outdoor Field MVP award after setting a school record in the pole vault as she posted a second place finish at the state meet this year. Cameron Dantzler earned the boys Field MVP award as he competed in the three jumps at this years outdoor championships. Senior Tommy Brocato (LSU signee) earned the Captains Award along with the Sportsmanship award as he showed team leadership and great sportsmanship throughout his entire career at Saint Thomas. Sophomore Chris Freese earned the Most Improved Award, while Sophomore Courtney Dawsey and Freshman Patricia Todd were the girls Most Improved athletes. Dawsey went from not even competing in the State Meet as a freshman in the 300 hurdles to winning the event this year and pulling teammate Todd to a fourth place finish in the 300 hurdles at the state meet. Senior Andrew Jordan earned the Sportsmanship Award with Brocato, while Destiny Williams and Meghan Becerra were the girls Sportsmanship award as they were part of the indoor and outdoor record setting 1600 meter relays. Madison Lymon and Alberto Valenzuela earned the Coaches award. Lymon competed in the discus, 100 and 400 meter relay at the state meet, while Valenzuela was a member of the STA 1600 meter relay at the state meet. The stars come out for Class 2A Regionals. Saint Thomas Aquinas ladies win Regional Championship and boys earn runner-up honors. Craig Rock named the Region 3-2A Overall MVP, Bobbi Amar named Region 3-2A Track MVP, and Cameron Dantzler earned the Field MVP award. HAMMOND—The Saint Thomas Aquinas girls flexed their muscles to overcome the Riverside girls which took an early lead in the field events to win the 2014 Region 3-2A Track and Field Championship title held at the St. Scholastica Academy Athletics Complex in Covington. The top three finishers qualified for next weeks LHSAA Class 2A State Championships to be held at LSU Berne Moor Stadium. The Riverside girls took a 67-58 lead after the field events, but, the STA girls won three of the last four events to score 48 points at the end of the meet. STA scored a total of (168) to runner-up Riverside with (109), Newman was third (73). Hannan fourth (47.5), St. Mary’s (N.O.) fifth (36), Sophie B. Wright sixth (34), St. James seventh (27), Fisher eighth (19.5), Runnels ninth (19) and Haynes Academy was tenth (16) in the field of nineteen teams. STA’s Bobbi Amar led the team with a pair of first place finishes in the 1600 (5:26.83) and 3200 (12:18.77), which earned her the Region 3-2A Track MVP award. Anna Miller was the pole vault (9-06) champion and was fourth in the 100 (13.71) and 200 (28.00), Crystal Rock won the triple jump (33-02) and was second in the long jump (17-01.25). Courtney Dawsey won the 300 meter hurdles (48.28) and was third in the 100 meter hurdles (17.29), while teammate Patricia Todd was second in the 300 meter hurdles (48.85). The STA girls 1600 meter relay team of: Todd, Destiny Williams, Meghan Becerra and Avrielle Steward won in (4:13.24). The 800 meter relay team of Williams, Steward, Todd and Dawsey qualified at the secon position (1:49.82), while the foursome of Miller, Jordan Strahan, Rock and Madison Lymon also posted a second place in the 400 meter relay (52.11). Lymon was second in the discus (95-02), was third in the 100 (13.69) and 200 (27.79), Strahan was second in the high jump (5-0), fourth in the triple jump (31-09.25) and eighth in the long jump (14-04.75). Williams finished second in the 800 meters (2:27.79), while Becerra was fourth in the 800 (2:29.85) and eighth in the 400 (1:05.87). Steward was second in the 400 (59.88), Regan Bolton finished fourth in the shot put (30-07) and discus (89-07) and was eleventh in the javelin (73-0), Krystal Cyprian was fifth in the shot put (28-10) while Jordyn Neal placed eleventh in the 1600 (6:47.67). The Newman boys captured the team title with (109), STA was second (86), Carver was third (77.5), Pope John Paul fourth (48), St. James fifth (34), Riverside sixth (33), Hannan seventh (27), Runnels and Northlake Christian eighth (26) and South Plaquemines was tenth (20) in the field of eighteen teams. STA’s Craig Rock earned the Region 3-2A Overall MVP with a pair of wins in the 110 meter hurdles (14.51) and 300 meter hurdles (37.56) and was third in the 100 meters (11.19). Rock also anchored the winning STA 1600 meter relay with Tommy Brocato, Chris Freese and Alberto Valenzuela. STA’s Cameron Dantzler earned the Field MVP award with a pair of wins in the triple jump (42-02.75) and long jump (22-04) and was also third in the high jump (5-08). Brocato was the 800 meter champion (2:09.38) and was second in the 1600 (4:43.00). Mason Miller qualified third in the pole vault (10-06) and James Cox was tenth in the shot put (36-00.50). “Anybody can be a STAR! ...” STA Track captures District Championships. Saint Thomas Aquinas boys and girls capture team titles in Tuesday’s District 7-2A Championships. HAMMOND—The St. Thomas Aquinas boys and girls captured team titles in Tuesday’s District 7-2A Championships held at the SSA Track and Field Complex in Covington. The STA girls scored (198), Runnels was second (88), Springfield third (42) and Doyle fourth (5). STA’s Madison Lymon earned the Overall MVP with a wins in the discus (97-03), 100 (13.64) and 200 (28.55) and also ran a leg on the winning 400 meter relay (52.90) with Jordan Strahan, Anna Miller and Crystal Rock. Strahan was named the Field MVP with a win in the high jump (4-10) and a pair of second place finishes in the long jump (14-4.25) and triple jump (31-01.75). Courtney Dawsey led the Saint Thomas girls on the track to earn the Track MVP with a pair of wins in the 100 meter hurdles (17.66) and 300 meter hurdles (49.13) and also joined Patricia Todd, Avrielle Steward and Destiny Williams on the winning 800 meter relay (1:51.80). Anna Miller set a new meet record in winning the pole vault (10-07) and was second in the 100 (13.87) and 200 (28.64). The Saint Thomas girl’s 1600 meter relay team of Todd, Stewart, Williams and Meghan Becerra won in (4:19.16). Bobbi Amar was a double distance winner in the 1600 (5:35.80) and 3200 (12:08.51), while Regan Bolton won the shot put (31-04.50), was second in the discus (91-07) and third in the javelin (74-03). Rock was a double winner in the long jump (16-00.50) and triple jump (33-00.50). Steward won the 400 meters (1:01.90), Williams won the 800 (2:26.79), while Becerra was second in the 400 (1:07.59) and 800 (2:30.76). Todd finished second in the 300 meter hurdles (50.44), Krystal Cyprian posted a second place finish in the shot put (28-02.50), while Jordyn Neal qualified at the fourth position in the 1600 (6:24.06) and 3200 (15:14.35). Springfield’s Emily Simeon was second in the javelin (75-05), third in the discus (75-04) and was fourth in the shot put (23-03.75). Tyra Schneider was second in the 100 meter hurdles (21.43) and was third in the 300 meter hurdles (1:02.69). The Saint Thomas boys scored (115) to out-muscle Springfield (97), Runnels was third (85), St. Helena Central fourth (40) and Doyle was fifth (16). STA's Craig Rock earned the Overall MVP award with three individual wins in the 100 (11.10), 100 meter hurdles (14.29) and 300 meter hurdles (38.94) and also ran on the winning 1600 meter relay (3:40.17) team with Tommy Brocato, Alberto Valenzuela and Chris Freese. Brocato earned the Track MVP with three first place finishes in the 1600 (4:54.31), 800 (2:14.03) and 3200 (11:04.91). Cameron Dantzler earned the Field MVP award for the falcons with three wins in the high jump (5-04), triple jump (43-07.50) and long jump (21-02.50) and also qualified fourth in the 200(24.41). Chris Freese won the 400 (55.20) and James Cox was second in the shot put (38-01.50) and qualified fourth in the discus (75-09) and javelin (85-04). Springfield’s Josh Taylor won the 200 (23.95), Travis Tillman won the discus (102-03), Reeves Blankenship was second in the javelin (105-08), Chris Carter won the shot put (39-06.50), while Joseph Kemp was second in the long jump 20-00.50). The Bulldogs 800 meter relay team of Claiborne, Taylor, Schneider and Kemp won in (1:36.14), while the 400 meter relay team of Ashton, Taylor, Schneider and Kemp won in (46.44). The 1600 meter relay team of Taylor, Sykes, Allen and Barnett qualified at the second position in (3:52.37). STA Track & Field collects a pair of runner-up team finishes. Falcons and Lady Falcons finish second at annual SLU Strawberry Relays. Rock triple individual winner. Brocato and Dantzler double individual winners. Anna Miller vaults a new personal best winning the Ladies Pole Vault. Freshman Clayton Ourso wins 3200 meters. Lady Falcons dominate relays. HAMMOND—The Saint Thomas Track and Field scored a pair of runner-up finishes Friday in the annual SLU Strawberry Relays. The Falcons came up just short against the boys meet winner De La Salle with 101 points as Saint Thomas finished with 95 followed by Hammond High with 65. On the ladies side, the Lady Falcons rolled up 96 points to finish behind Dominican High with 136. Saint Scholastica was third with 63. Senior Craig Rock stole the show on the track collecting three individual wins including the 110 hurdles (15.02), the 300 meter hurdles (38.26), and the 100 meter dash (11.33). Sophomore Cameron Dantzler was a double winner in the field taking the high jump (5-08.00) and the long jump (21-10.00). Senior Tommy Brocato cleaned up in the middle distance races winning the 800 meters (2:07.49) and the 1600 meters (4:43.20). Senior Anna Millers set a personal best in winning the ladies pole vault with a vault of 11 feet. Freshman Clayton Ourso impressed in the 3200 meters winning by 23 seconds over his nearest competitor finishing in a time of 11:11.25. The Lady Falcons ran away with the 4x200 and 4x400 relay races. The team of Destiny Williams, Patricia Todd, Courtney Dawsey, and Avrielle Steward won the 4x200 in a time of 1:50.94, and the team of Destiny Williams, Meghan Becerra, Patricia Todd, and Avrielle Steward claimed the top spot in the 4x400 relay with a mark of 4:12.36. Rock DOUBLES UP at Dutchtown! Senior Chris Rock dominated the hurdles scoring wins in the 110 and 300 meters. Senior Anna Miller was tops in the pole vault, sophomore Regan Bolton take top spot in shot put champion and junior Bobbie Amar wins 1600 meters. GEISNAR, LA—The St. Thomas Aquinas girls and boys track team competed in the 2014 Dutchtown – Innovative Care Track and Field Invitational Friday at Dutchtown High School in Geismar Friday. Zachary won the girls division with (92), STA was second (72), St. Michael’s thir(60), St. Amant fourt(57), Dutchtown fifth (56), Parkview Baptist sixth (55), Dominican sevent(51), Ascension Catholic eight(44), Woodlawn ninth (39) and East Ascension was tenth(31). Catholic High captured the boys team title with (192.50), St. Amant was second (83), Zachary third (76), Dutchtown fourth (66), Woodlawn fifth (41), STA sixth (40), East Ascension seventh (23.50), Parkview Baptist eighth (18), Ascension Catholic ninth (14) and St. Michael’s tenth (4). “The STA girls led the meet until the 200 meters, and we didn’t have anyone in the 3200 or 1600 meter relay due to several illnesses,” said Saint Thomas head track coach Miguel Becerra. Regan Bolton and Madison Lymon led the Lady Falcons in the field events. Bolton was the shot put champion (31-3), was fifth in the discus (90-4) and ninth in the javelin (60-8), while Lymon won the discus (101-04), was 14th in the shot put (26-03), Lymon also posted an eighth place finish in the 100 (13.68) and placed eleventh in the 200 (28.98). Anna Miller won the pole vault (9-08), was tenth in the 200 (28.83) and was eleventh in the 100 (13.90). Bobbi Amar was the 1600 meter champion (5:23.43), while teammate Jordyn Neal was twelfth in the 1600 (6:48.16). The STA team of Destiny Williams, Courtney Dawsey, Patricia Todd and Avrielle Steward posted a second place finish in the 800 meter relay (1:50.51). Todd was third in the 300 meter hurdles (49.25), while Dawsey was fifth in the 300 meter hurdles (49.90) and 100 meter hurdles (18.06). Steward was third in the 400 (1:03.94), while Meghan Becerra placed second in the 800 meters (2:28.68). Lymon and Brocato pace Saint Thomas in Nokia Sugarbowl Track and Field Classic. Madison Lymon third in discus and Tommy Brocato third in 800 meters. NEW ORLEANS—Madison Lymon and Tommy Brocato led the St. Thomas Aquinas Track and Field team with top performances in Friday and Saturday's Nokia Sugarbowl Track and Field Classic held at Tad Gormley Stadium in New Orleans. Lymon led the lady falcons with a third place finish in the discus (101-04) and was 33rd in the shot put (25-06.50), while teammate Regan Bolton was 19th in the discus (78-08) and 20th in the shot put (27-08.75), while Anna Miller posted a fifth place finish in the pole vault (10-06). The STA girls 1600 meter relay team of Destiny Williams, Meghan Becerra, Patricia Todd and Avrielle Steward posted a fourth place finish with a seasonal best time of (4:13.06). Williams also placed sixth in the 800 (2:25.75), while Becerra was tenth in the 800 (2:28.73) and was 28th in the 1600 (5:48.98). Steward was 17th in the 400 (1:03.97) and Todd was 20th in the 300 meter hurdles (49.61). The lady falcons foursome of Williams, Courtney Dawsey, Todd and Steward placed 18th in the 800 meter relay (1:51.03). Dawsey also placed 19th in the 300 meter hurdles (49.27). Bobbi Amar finished eleventh in the 1600 meters (5:26.40), while Jordyn Neal was 34th in the 3200 (14:52.42). The Lady Falcons finished thirteenth in a field of over 100 teams that competed from Louisiana, Tennessee, Georgia, Alabama, Mississippi and Florida. Brocato led the Falcons with a third place finish in the 800 meters (1:57.28). Craig Rock posted the top time in the 300 meter hurdles (38.26) and the second best time in the 110 meter hurdles (14.43) prelims, but was unable to attend the finals on Saturday. Clayton Ourso posted a 37th place finish in the 3200 (11:28.38), while Andrew Jordan was 48th in the 3200 (12:40.17). Bryon Garrity was 53rd in the 1600 (5:22.85), Chris Threeton placed 66th in the 1600 (5:44.33), Chris Freese (400-55.71-46th), Alberto Valenzuela (400-59.51-62nd) and Cameron Dantzler was 69th in the 200 (26.83). The STA teams will be competing in Fridays Newman Invitational at West Jefferson High School. Saint Thomas Lady Falcons dominate Judy Baehr Relays. Lady Falcon Crystal Rock and Riverside Academy’s Michelle Hayes were Field Co-MVP’s. Falcons place third. HAMMOND—The Saint Thomas Aquinas High School girls Track and Field team claimed the 2014 STA-Judy Baehr Relays team title with (128) points, Walker was second (92), followed by SSA (72), St. Katherine Drexel (57), John Curtis (50), Louis McGehee (38), Riverside Academy (30), Catholic Pointe Coupee and country Day (26), Hosanna Christian (25), Maurepas (11) and Albany (5). STA’s Crystal Rock and RA’s Michelle Hayes were Field Co-MVP’s, while JC’s Monae Lewis was the Overall MVP and Drexel’s Shannon Ray was the Track MVP. Rock had a pair of wins in the long jump (17-2.50) and triple jump (32-10). Rock also joined Destiny Williams, Patricia Todd, Avrielle Steward’s last second jolt in the final twenty meters of the race put the lady falcons foursome just ahead of Drexel to capture the 800 meter relay in (1:49.09). Williams was second in the 800 meters (2:28.74) and Meghan Becerra was third (2:31.73) Steward was the 400 meter champion in (1:02.50), while Todd was third in the 300 meter hurdles (50.15) and Courtney Dawsey was second in the 300 meter hurdles (49.69). Anna Miller was the pole vault champion (10-06), Regan Bolton was second in the discus (87-01) and fourth in the shot put (29-06), Jordan Strahan was second in the high jump (4-08). Bobbi Amar won the 3200 meters (12:14.99) and was second in the 1600 (5:34.36). The 1600 meter relay team of Williams, Becerra, Miller and Todd posted a second place finish in (4:24.32). The John Curtis boys captured the team title with (174), Walker was second (138), STA third (46), followed by Country Day (37), Albany (36), Hosanna (32), Pine (31), Riverside (25), Maurepas (14), St. Paul’s JV (13), Catholic Pointe Coupee (6) and Runnels (2). JC’s Devin Savwoir was the field MVP, JC’s Terrance Alexander was the Overall MVP and Hosanna’s Jeremy Williams earned the Track MVP. STA’s Brady Becerra was the 110 meter hurdle champion (15.85) and was second in the 300 meter hurdles (42.13). Tommy Brocato placed second in the 1600 (4:45.03), Mason Miller placed third in the pole vault (10-03), Chris Freese was third in the 400 (54.07) and Andrew Jordan was fourth in the 3200 (11:06.88) while Clayton Ourso was fifth in the 3200 (11:06.88).